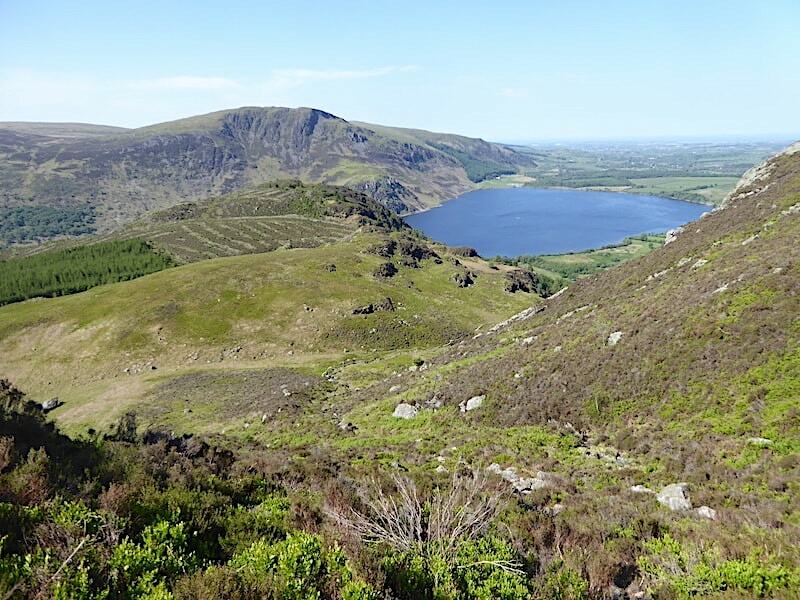 The warm sunny weather continues and we’re up and away early for a longish drive over to Ennerdale where we’ll take a long overdue walk up Great Borne and Starling Dodd. 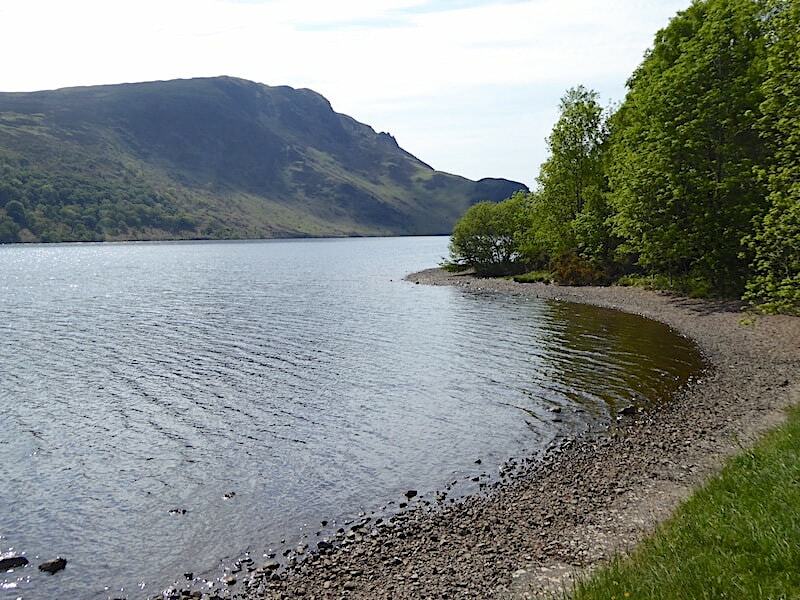 Its a very long time since we paid them a visit, and the same applies to their neighbours across Ennerdale Water and around Wast Water. 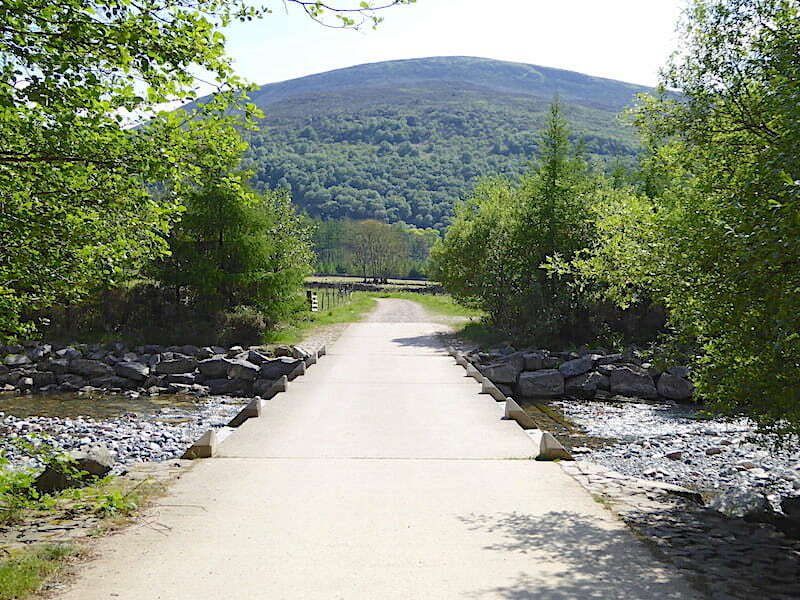 When there are so many good walks a lot closer to home its very easy to overlook those which are much further west and which involve driving across almost the whole of the county before you can even set foot on them. 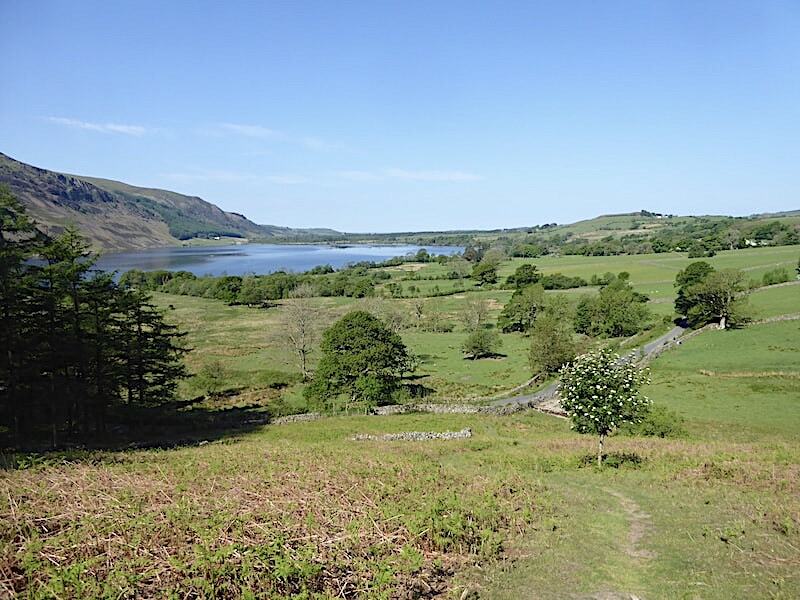 We resolve to make the effort and walk a few more of these long neglected fells this summer. Mind you, we’re very good at resolutions, its keeping to them that often sees us fall by the wayside. 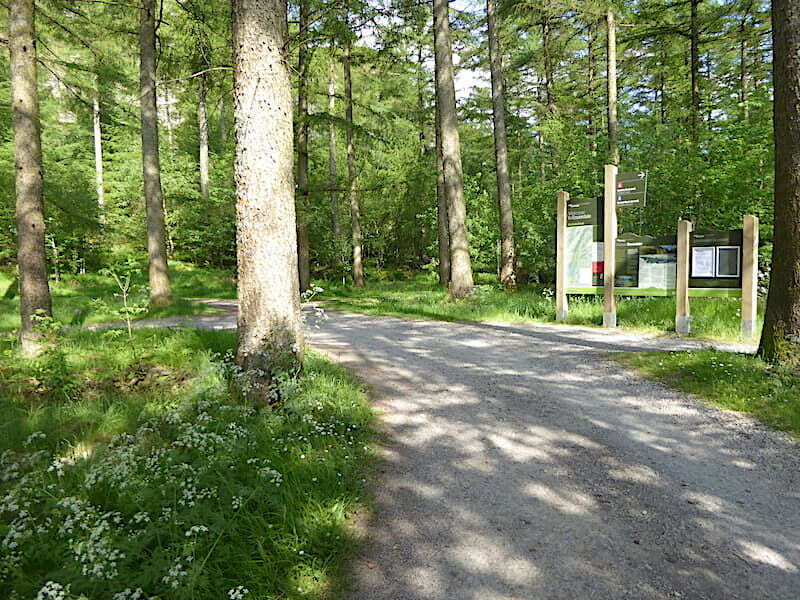 About four camper vans and just a handful of cars were parked up in the Bowness Knott parking area when we arrived, but its a large area and we had no trouble parking. The camper van occupants were still hunkered down although one did open one of their windows, noticed us and quickly closed it again. We’re not that scary surely. The lady occupant of one of the other camper vans was less concerned, she appeared at the door in what looked like nightwear, stepped down, wandered around the side of the van and nonchalantly brought in the towels from the clothes line. We tucked into our picnic breakfast, bacon butties and coffee, before starting out and thus fortified off we went, back down the lane we had just driven in on, back to a stile in the wall where the path begins. In the above shot the stile is located in the wall running above the large tree and the approach lane to the car park is hidden by the wall. 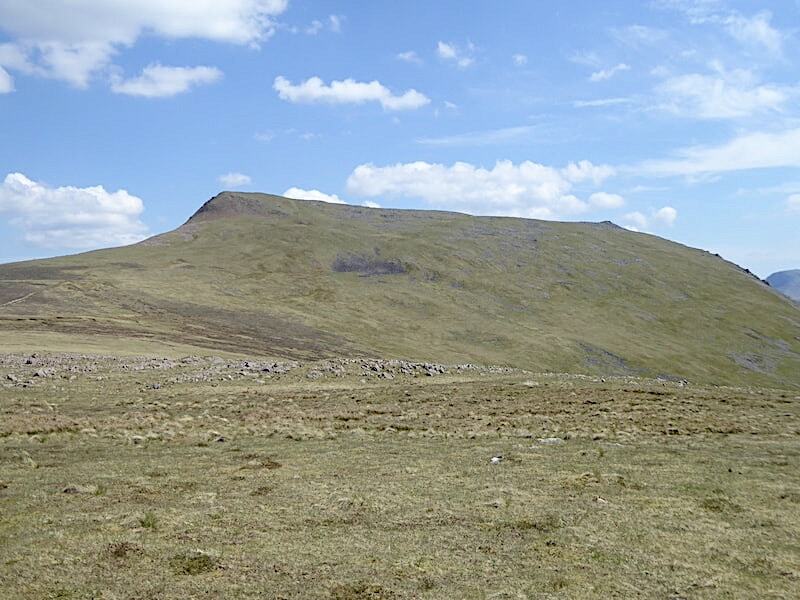 Its a warm sunny morning and the features on Crag Fell and Angler’s Crag below it are particularly well defined. 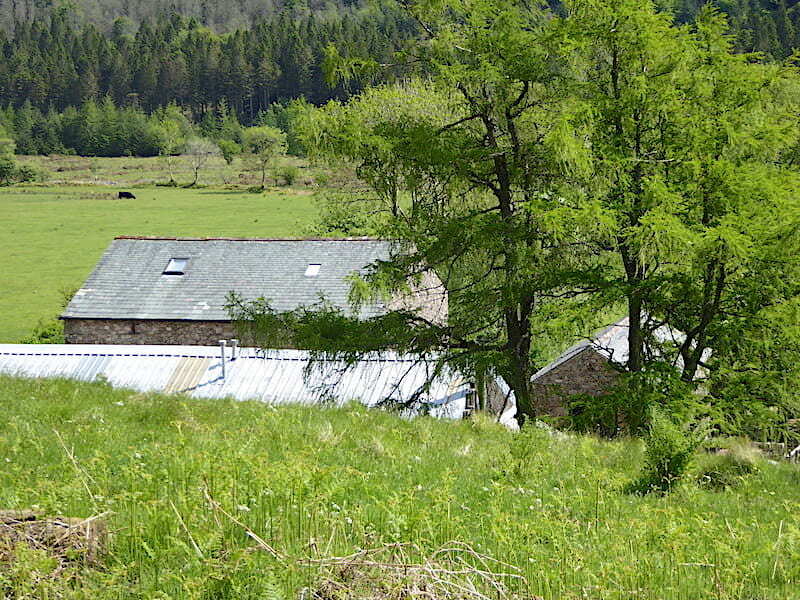 A look back at the approach to the car park, a very narrow lane coming in from Croasdale. 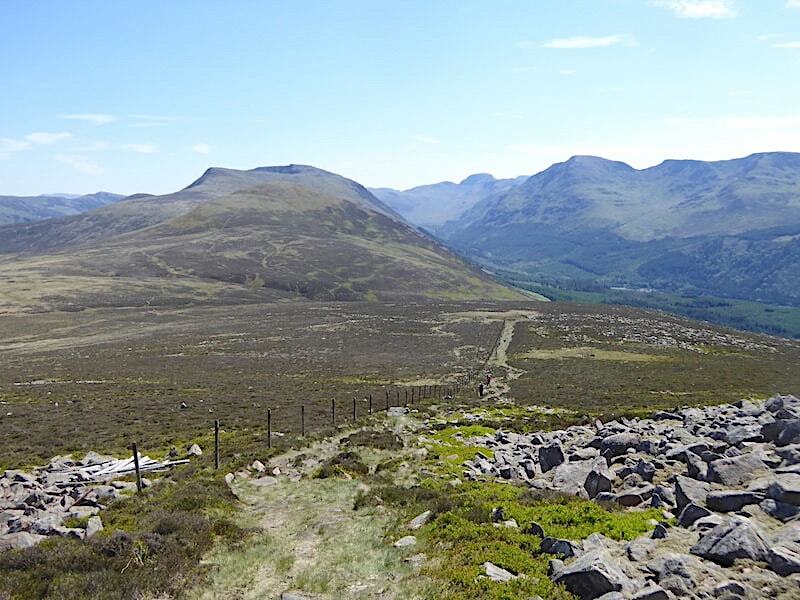 The path from the stile is obvious and easy to follow. The initial section is quite steep which combined with a very warm morning and the sun directly in our faces soon led to plenty of brow mopping. A welcome patch of shade for us as we reach the corner of the tree plantation and take a look ahead. 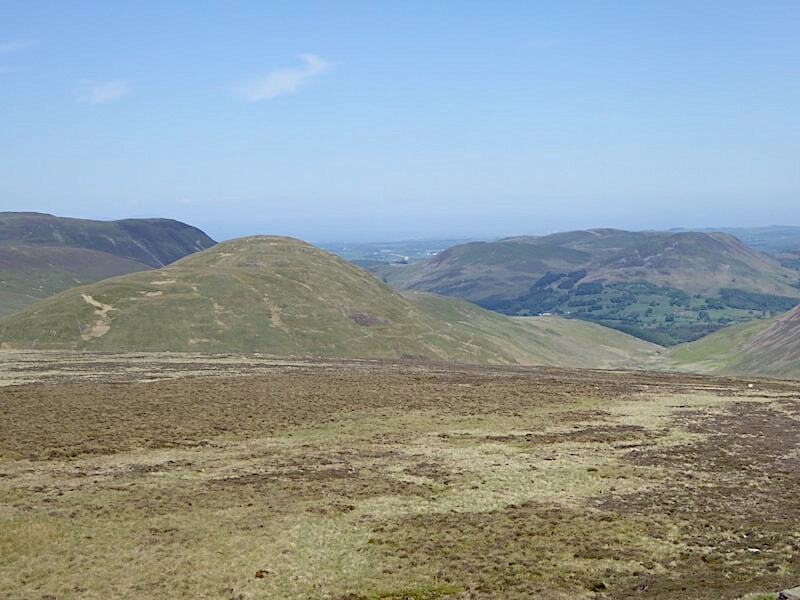 Bowness Knott is on the right and the slopes of Herdus are on the left, Rake Beck is running through the gully at the lower left. There’s a way to go before the gradient eases a little so we still have some more heavy lifting to do. There’s nothing by way of a breeze either and we’re about to walk into an open air furnace, best to adopt the ‘just keep putting one foot in front of the other and don’t think about it’ approach, I think. The gradient eases a little and we can take a breather and a few minutes to look back at our steep route up from the lane. Ennerdale Water looks very inviting right now but, short of running all the way back down and dunking myself in it, I’ll have to make do with revelling in the slight breeze which is wafting around us now that we have some height. The path and Rake Beck pair up once again a little further on and the gurgling and splashing of the water together with the slight breeze made the heat a little more bearable, and the walking much more enjoyable. 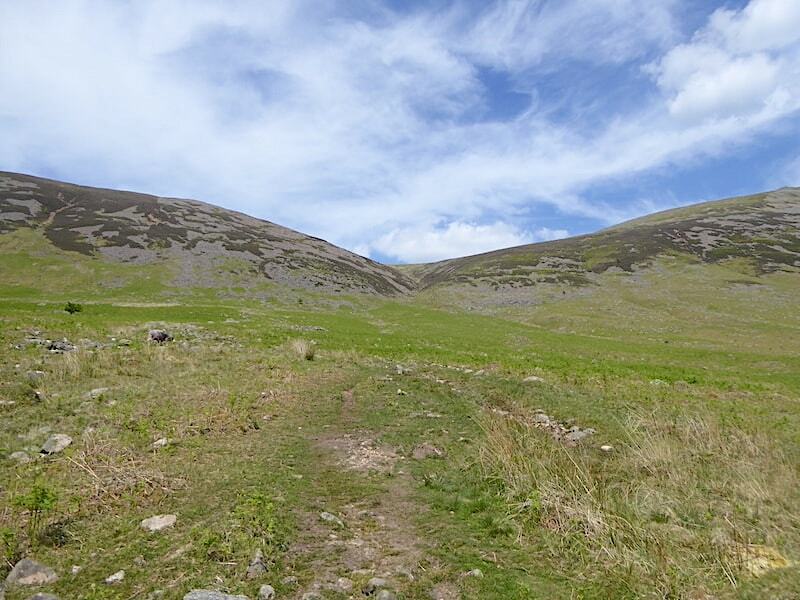 The brief spell of easier walking comes to an end as the path turns uphill and follows the course of the beck. Unbelievable though it may seem there is a path all the way up, even though the rocks, heather and bilberries are hiding it from view at the moment. 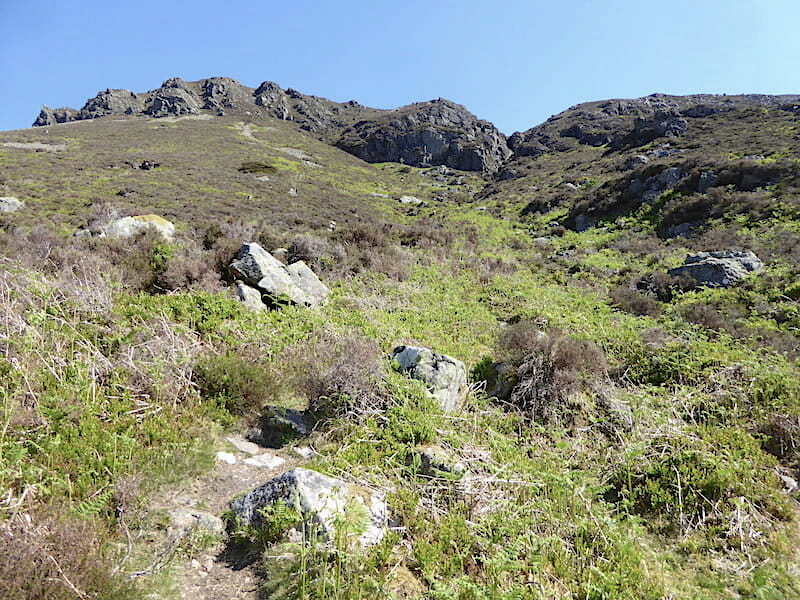 The path starts gently enough, slightly higher than Rake Beck which is to the right of the path as you look at the shot …..
….. but little by little the path becomes steeper, narrower, rougher and rockier and progress slows accordingly as we push our way through the rocks, heather and bilberries. An impressive skyline behind us so we pause to admire it for a moment or two. 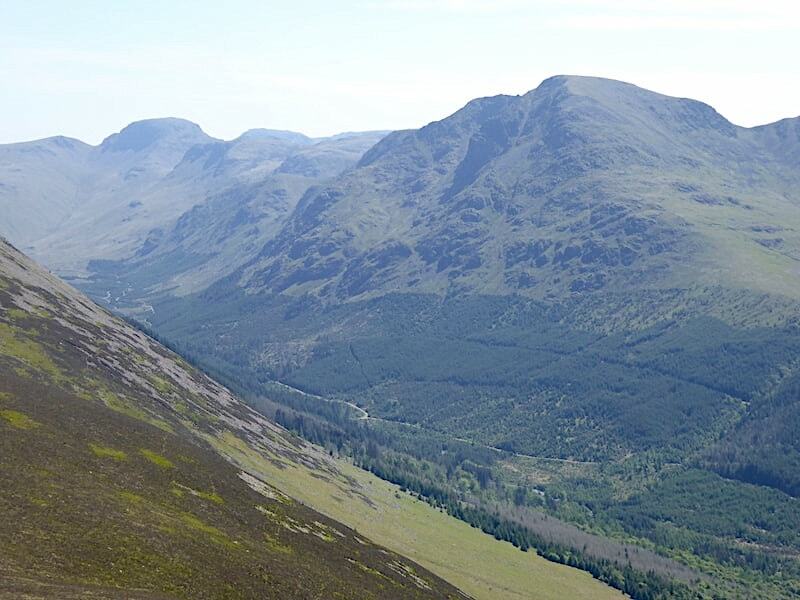 From left to right we can see Green Gable, Great Gable, Pillar, Wind Gap, Black Crag, the peak of Steeple followed by Scoat Fell, Haycock and Little Gowder Crag. 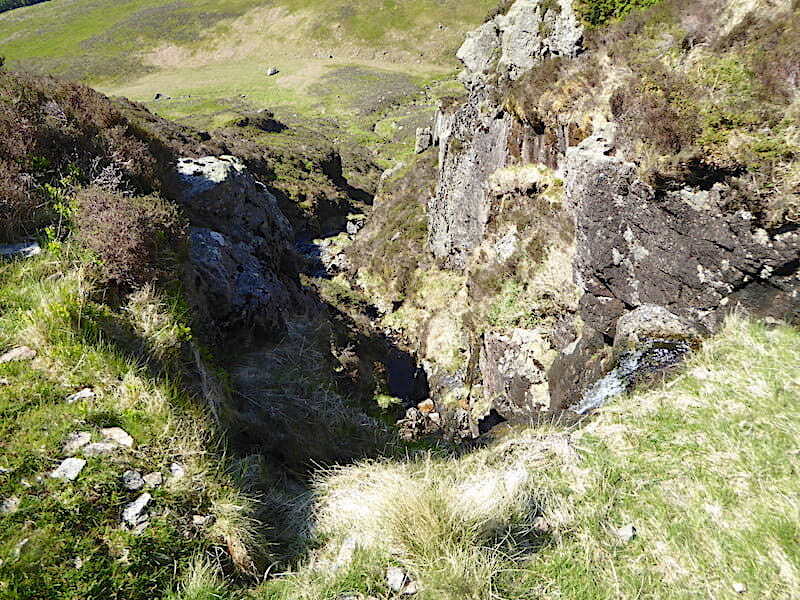 Another spell of rough and rocky path climbing brings us up to the old fox trap and an opportunity to stand upright for a moment or two …..
….. after which its back to yet more rough and rocky scrambling through the gully where Rake Beck is now confined and some distance below us. We now turn our attention to what is waiting for us up there. 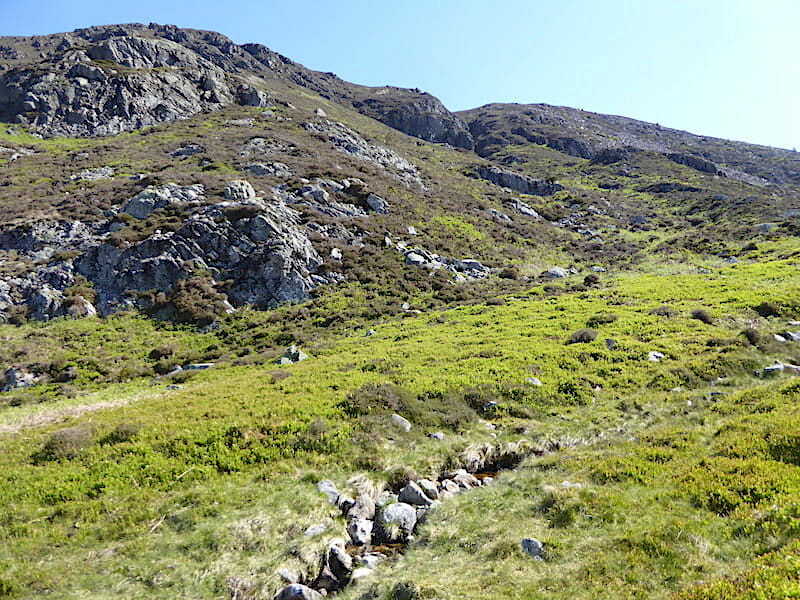 The path rises steeply through the heather to the right of the shot, and much higher above the beck, the vegetation is thicker and the stones and rocks turn into larger outcrops. 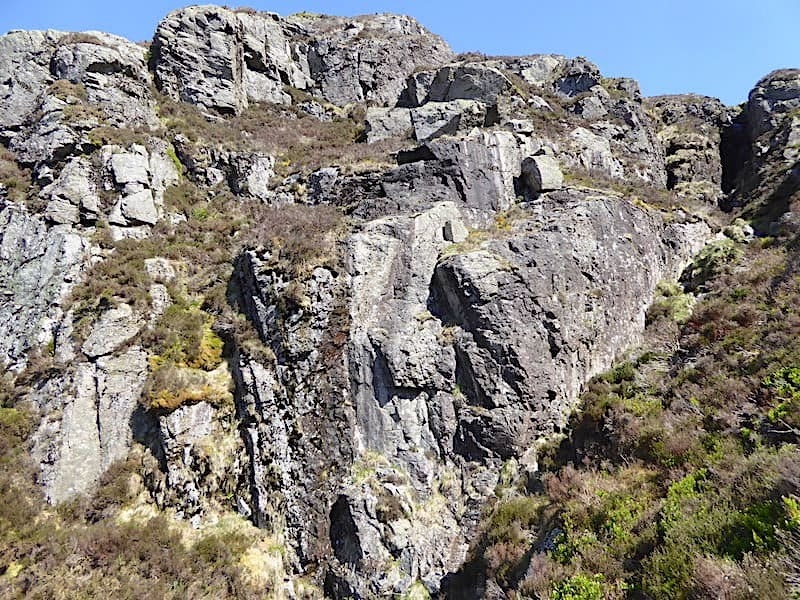 We are now in scrambling mode as the narrow path winds its way up, over and through the outcrops, with hands and feet seeking firm holds from which we can haul ourselves upwards. 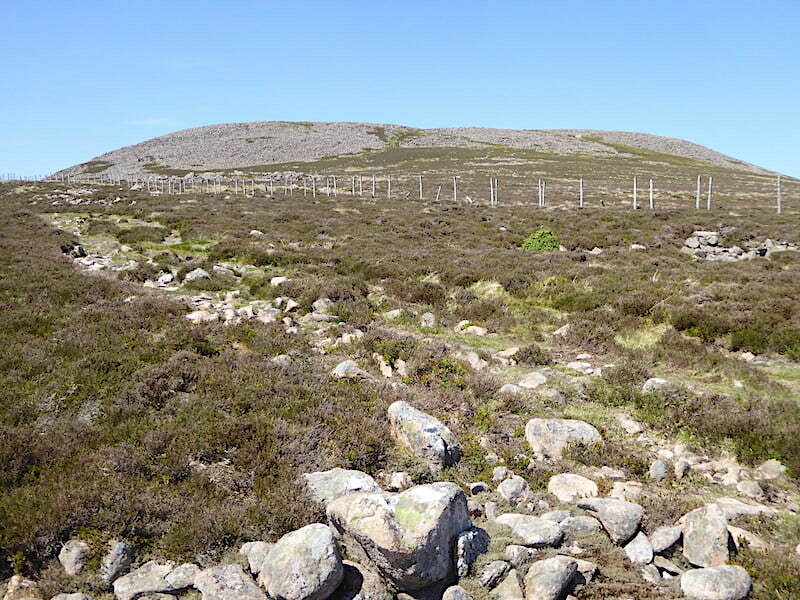 In places the path has fallen away, or is just about clasped to the fellside by a few heather roots, so care and attention is needed. 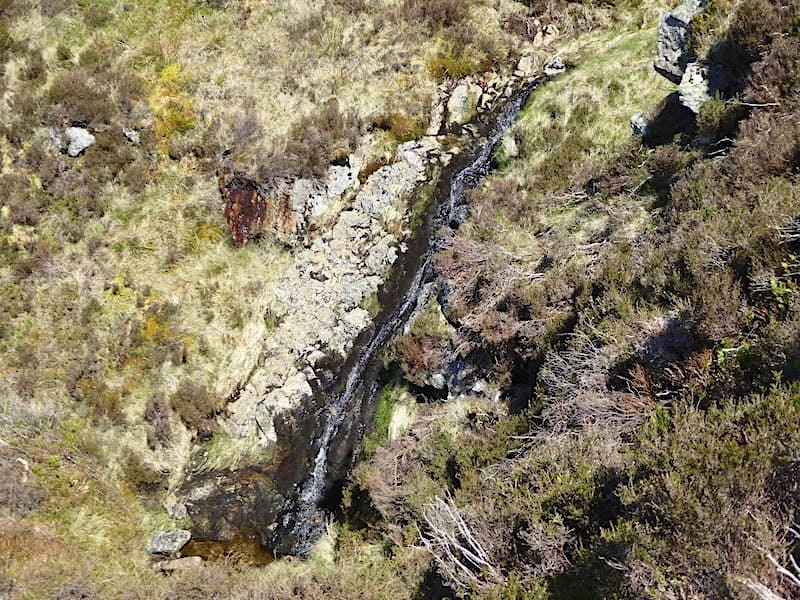 The beck isn’t a huge distance below but a slip into it wouldn’t be pleasant. 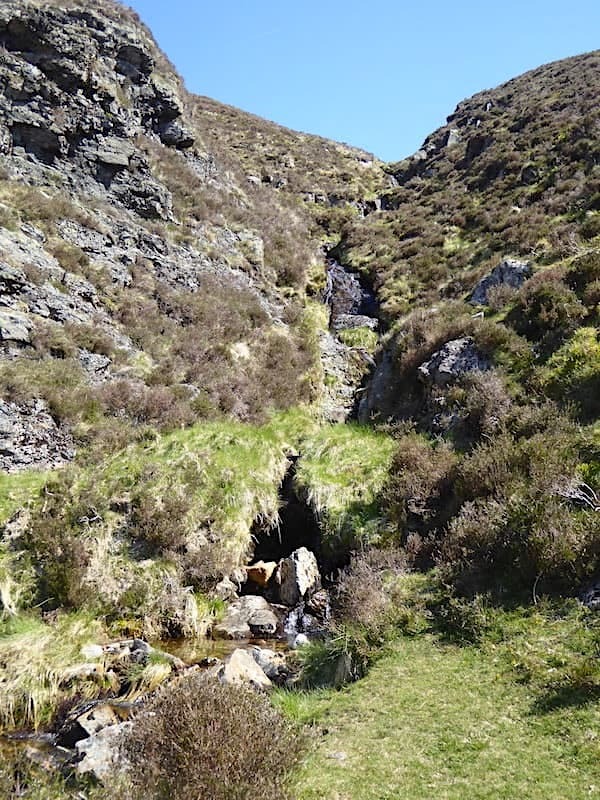 Thankfully the beck didn’t have a large amount of water flowing down it today so the often disquieting noise of water thundering down a gill beside you didn’t accompany our scramble, or serve to jangle the nerves. Safely beyond the deeper cleft of the gully and we can stand upright once again on this little grassy shelf, get our breath back and crank our vertebrae and muscles back into their respective positions. Oh come on, it can’t have been that bad. Well no, maybe not, but a constant forward lean on a steep climb does make the various body parts susceptible to a few twinges and creaks on assuming the vertical. Suitably smoothed out and ready to go again we view the next section of the climb from the comfort of our grassy shelf. This is simply more of the same so, as we’re only halfway up the stairs so to speak, we’d better get on with it. Only a thin trickle of water is coming down the waterslide today as we cross another section where yet more segments of the path have fallen away from their moorings so we have to find foot and hand holds higher up to bypass the gaps. 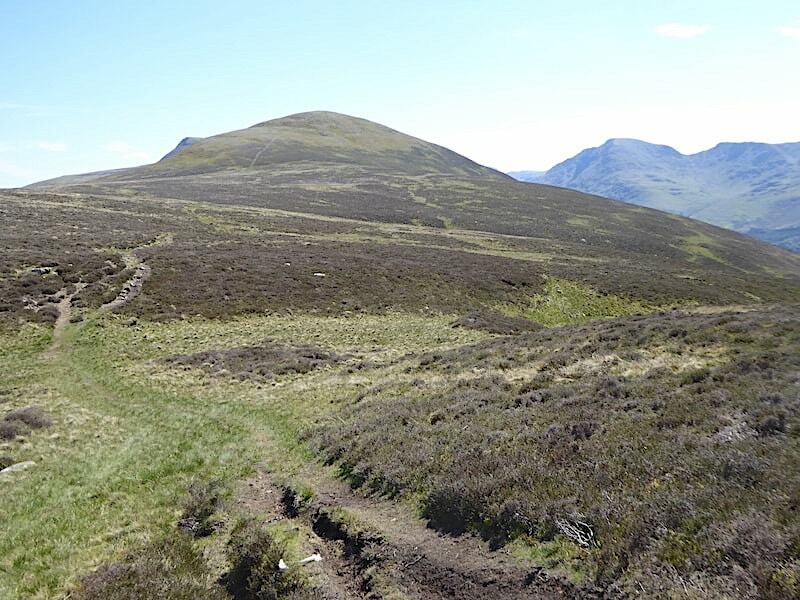 You’d think that anyone with an ounce of sense would be sitting on a beach somewhere today enjoying an ice-cream or an ice lolly instead of dragging their bare arms and legs up a steep hill through scratchy heather and sharp rocks wouldn’t you? But then, when you get to the end of it, you turn around and look back at the view behind, you forget all about ice-creams, lollies and beaches. The air feels wonderfully fresh after the heat of the gully, the breeze is gently ruffling our hair and cooling hot arms and legs, and right this minute there really isn’t anywhere else you’d like to be. From the top of the Rake Beck gully we make our way across the heather towards the rock strewn mound forming the summit of Great Borne. There’s still a little more rising ground to cross but the gradient is much easier now. The view back along the path we followed from the top of Rake Beck with Herdus at the far end, across the low saddle between it and Great Borne. 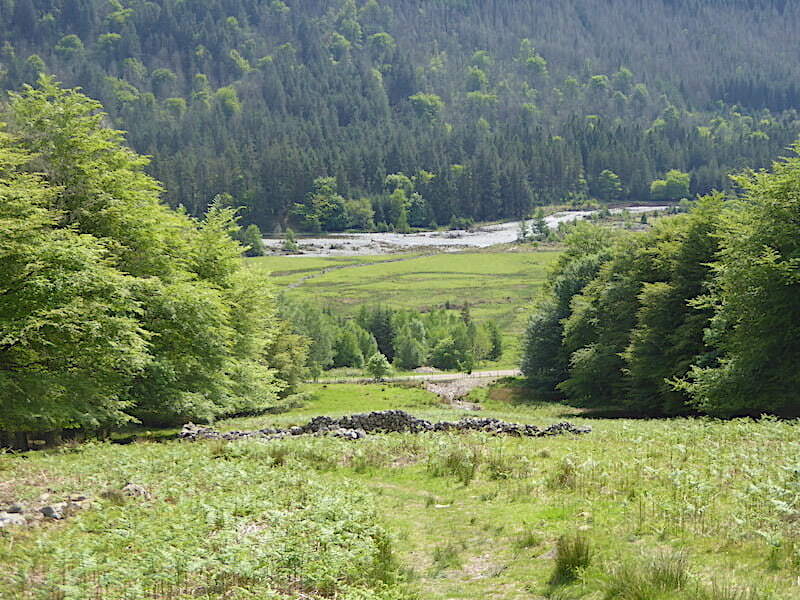 The views begin appearing as we cross the rising ground. 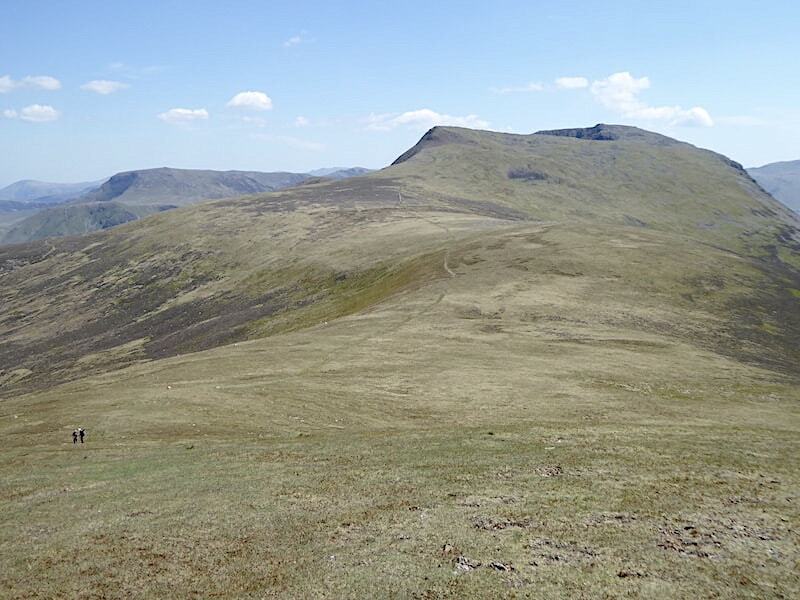 The higher fell on the left skyline is Gavel Fell, just visible to the right of it is Blake Fell with the grass and heather clad ridge leading across to Carling Knott, and the sliver of fell top peeping up behind the Carling Knott ridge is Burnbank Fell. 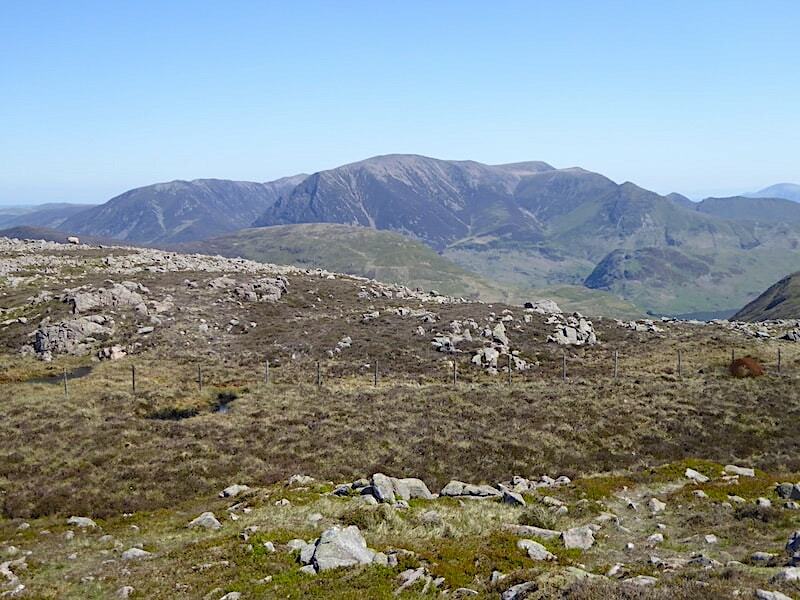 To the northeast of us is the Grasmoor group of fells …..
….. while directly ahead is Starling Dodd, although it looks rather outdone by Buttermere’s Red Pike and the rest of the High Stile ridge. 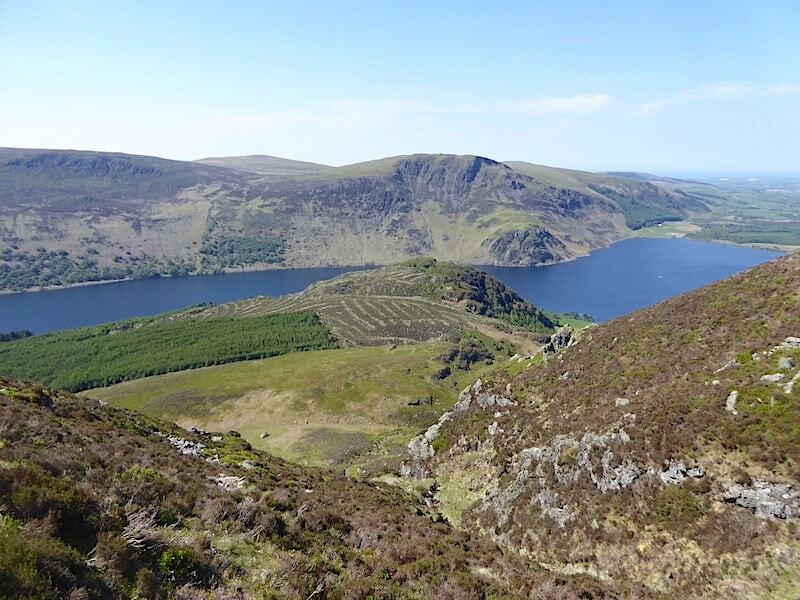 Across Ennerdale is the dramatic skyline of Pillar and its neighbours, once again serving as a reminder that we have neglected them for far too long. 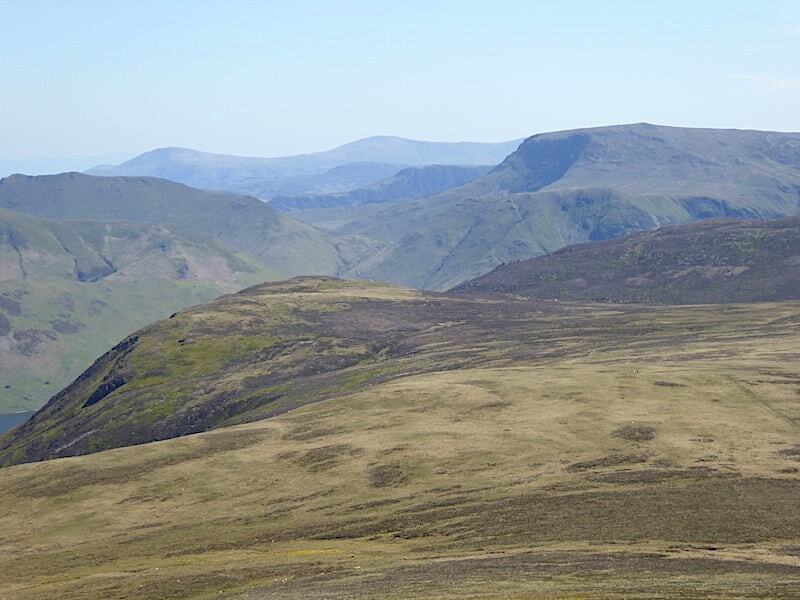 There is still some haze around but on the distant skyline Clough Head and Great Dodd can at least be seen. 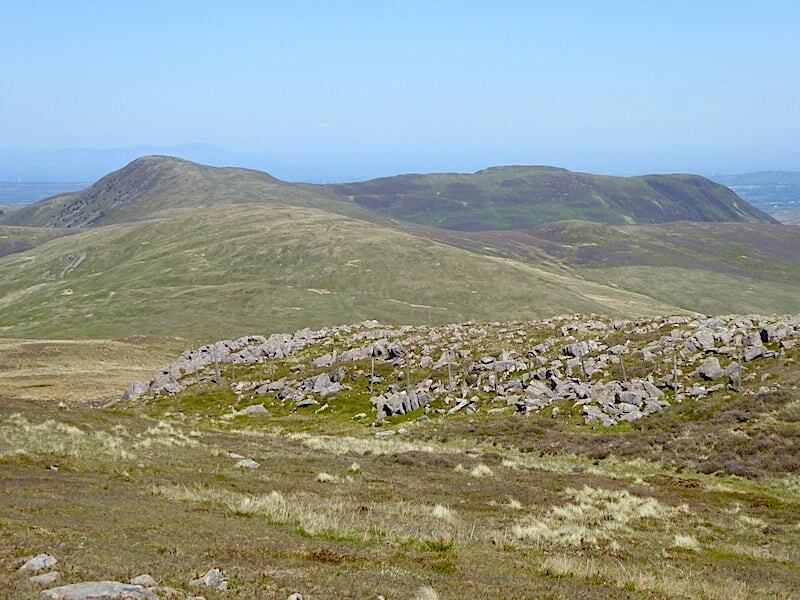 The summit of Robinson is on the right, above the great gash of Robinson Crags. Once on the summit of Great Borne we stopped for a break and a Mars Bar, followed by a very enjoyable ten minutes or so wandering around or just sitting and enjoying the views. 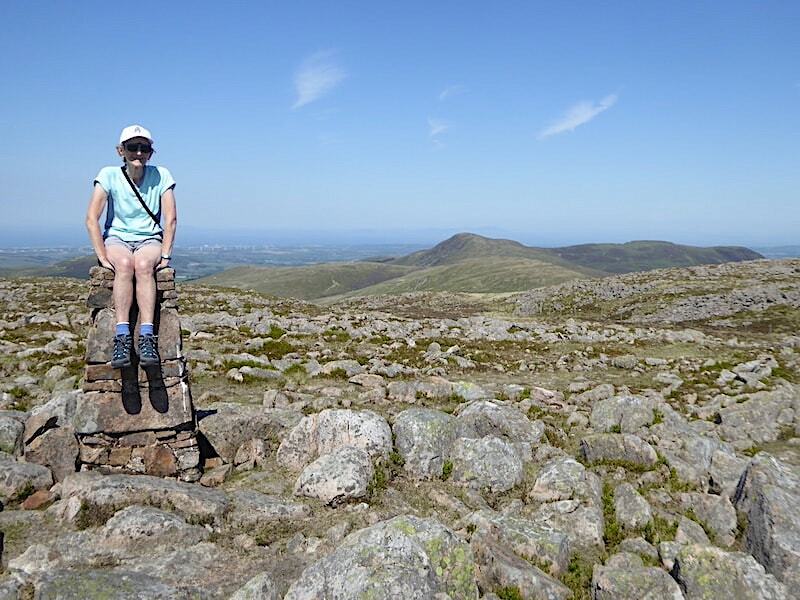 There’s no difficulty finding a suitable place to sit, the summit area is full of rocks, so overwhelming a choice is there that you’re in danger of becoming very picky about which one will be just perfect for the occasion. There was a young man up here too, grabbing a day on the fells, and making the most of the weather, on his day off from work. Nice young fella he was too, chatty without being intrusive and it was encouraging to see that he was using a proper map and not simply relying on a mobile device to guide him round. 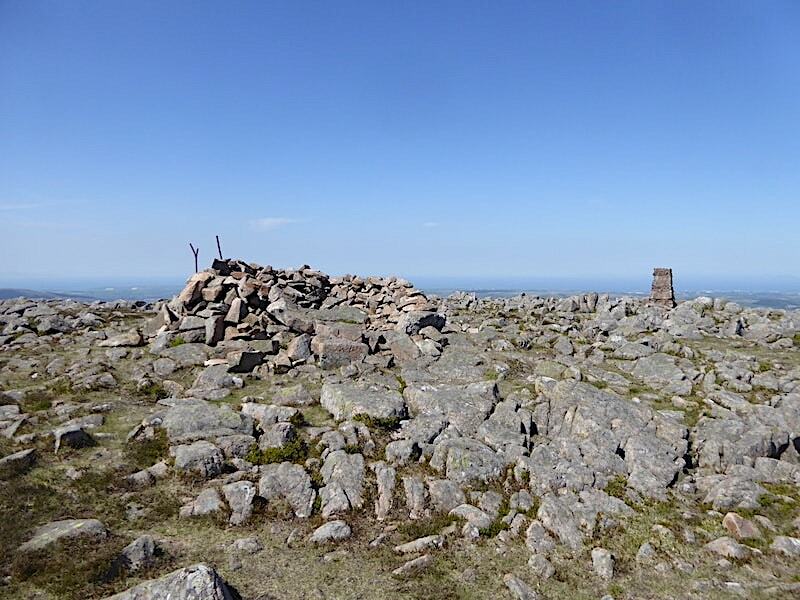 The young chap went on his way with a cheery ‘see ya then’ , seemingly heading in the direction of Steel Brow, Great Borne’s north ridge, and we spent a few more minutes just enjoying the weather and the peace and quiet of an empty summit. Break over so we hoist packs again and set off down the hill and head for Starling Dodd with a view of the fells around Ennerdale all the way along. 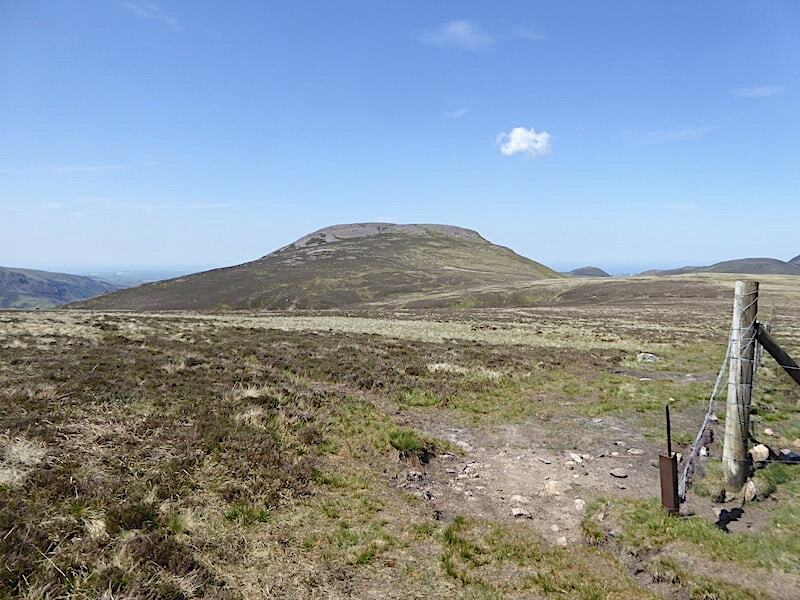 This is easy walking for us but spare a thought for the pair of walkers below us who are sweating their way up towards …..
….. this, the summit of Great Borne seen from our descent route. 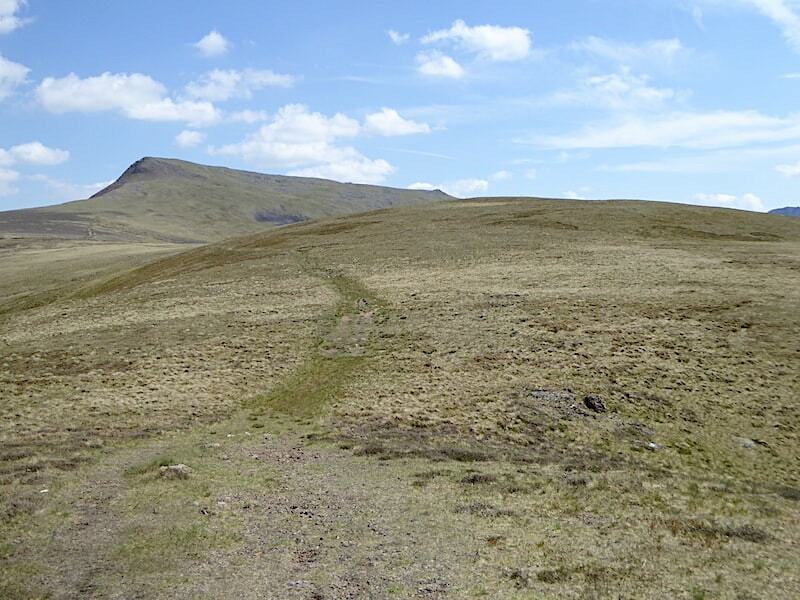 A very enjoyable spell of walking as we cross over to Starling Dodd on firm, dry paths and springy turfs. 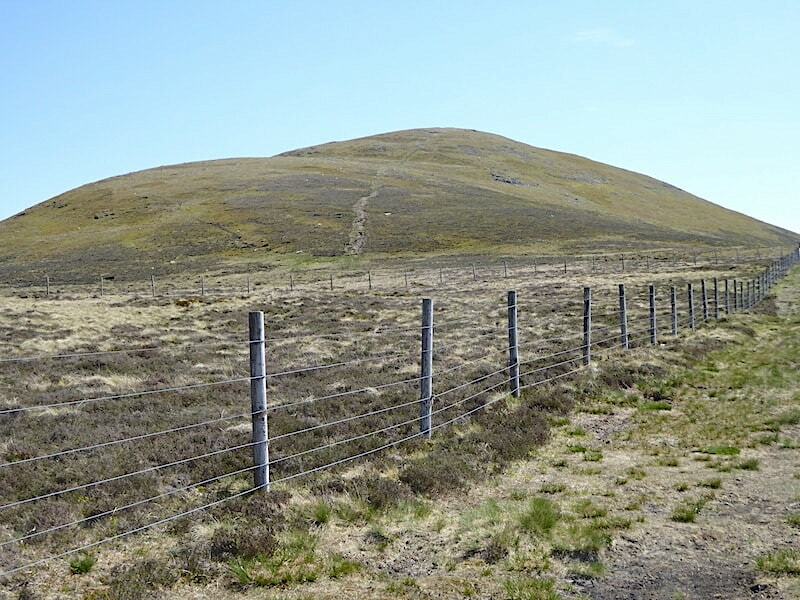 We’ve never been absolutely sure what this fence is protecting, the ground on the enclosed side doesn’t look any different to that on this open side. 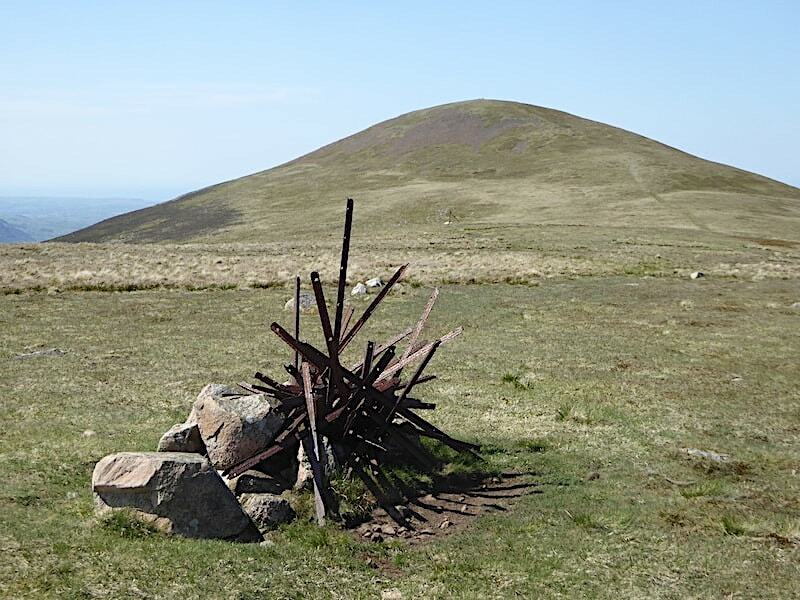 Whatever its precise reason may be its also a handy navigational aid, if one is needed, for part of the walk across to Starling Dodd …..
….. although it won’t lead you all the way to the summit because at this fence corner post it turns back on itself and seems to form a triangular enclosure around nothing in particular. Be that as it may the fence corner comes in handy as a point from which to look back for this view of Great Borne. Just a little further on from the corner post we follow the path leading up to the top of Starling Dodd. 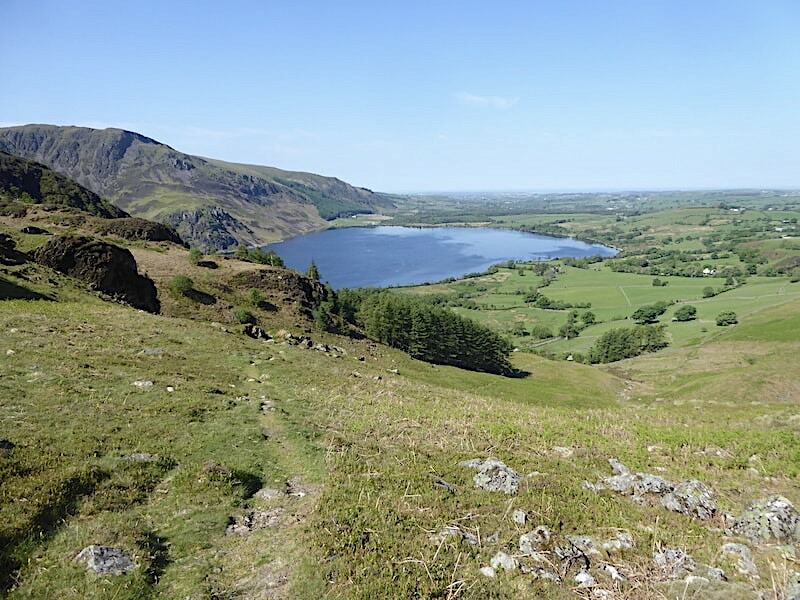 As we climb we have a view of Mellbreak …..
….. and one of Hen Comb and the Loweswater fells. 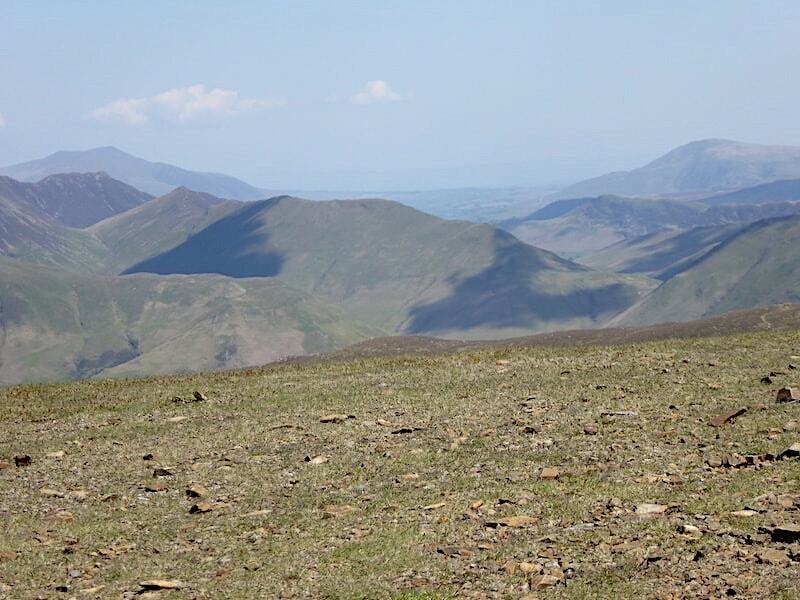 It was just around here that we met a couple who were descending Starling Dodd and they stopped for a chat. 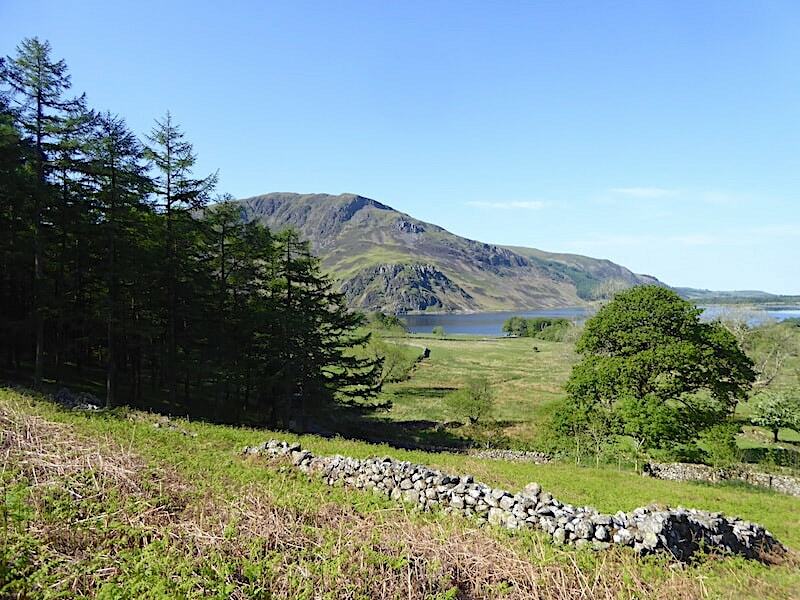 During the course of the conversation we learned that they were six fells short of completing their round of the 214 Wainwright fells, that they were parked near the Kirkstile Inn in Loweswater, and that it had taken them three and a half hours to get from there to Starling Dodd. Not quite sure which route they took other than it wasn’t Mosedale apparently. 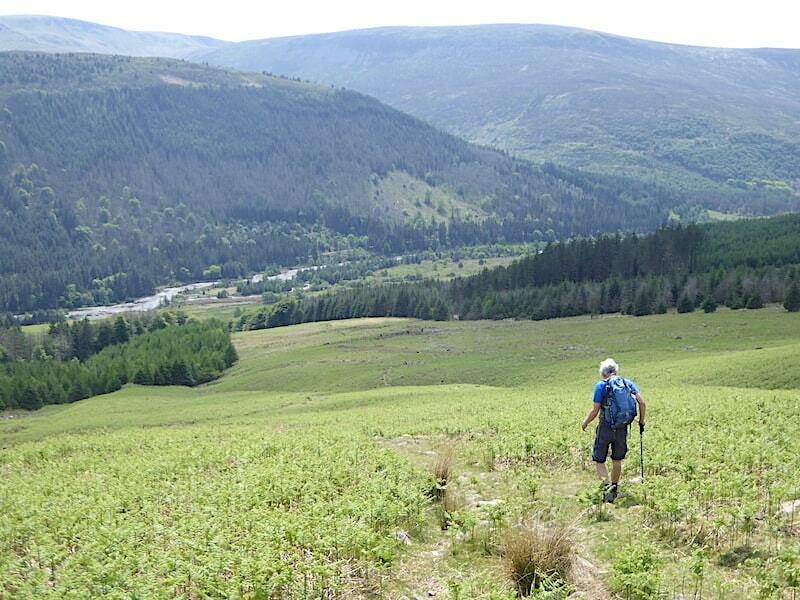 They said they weren’t going on to Great Borne either, although when they left us they headed off in that direction, so we were a little puzzled as to what route they would take to get back to Loweswater. From the climb up Starling Dodd a view of Hen Comb, on the right, and Gavel Fell and its neighbours on the centre skyline. 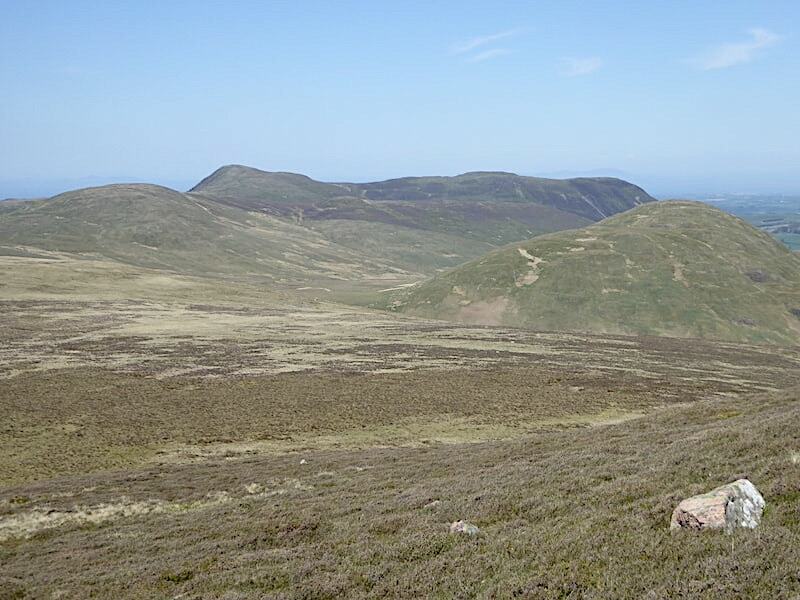 Looking back to Great Borne as we approach the summit of Starling Dodd. 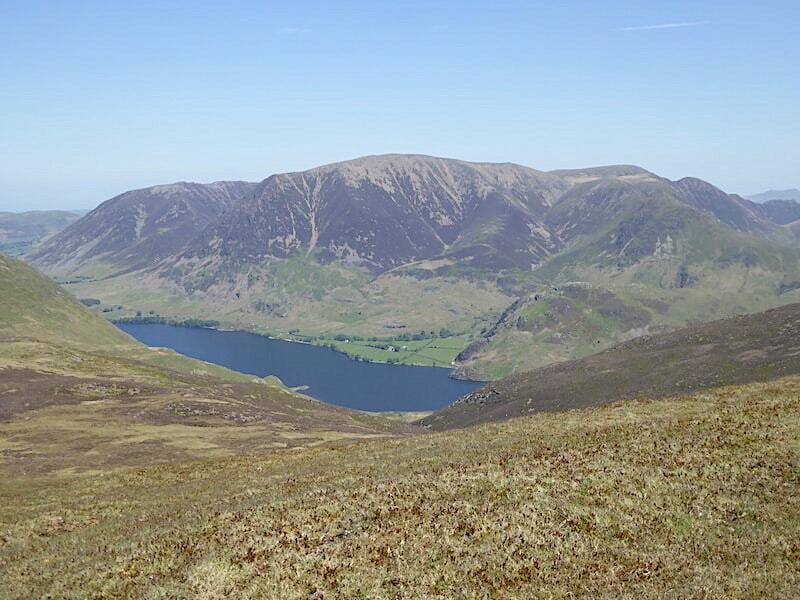 Another view of Mellbreak below us …..
….. and another look at the Grasmoor group above Crummock Water. 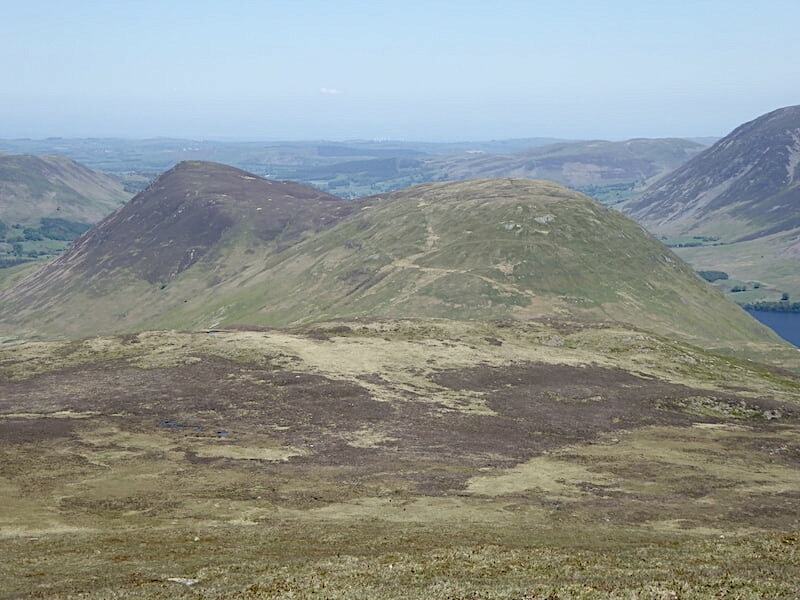 Two more walkers toiling up the steep sides of Starling Dodd as I look ahead towards Little Dodd and the Red Pike ridge …..
….. and then peer down into Ennerdale with Green Gable, Great Gable, Kirk Fell and Pillar forming an orderly queue alongside. 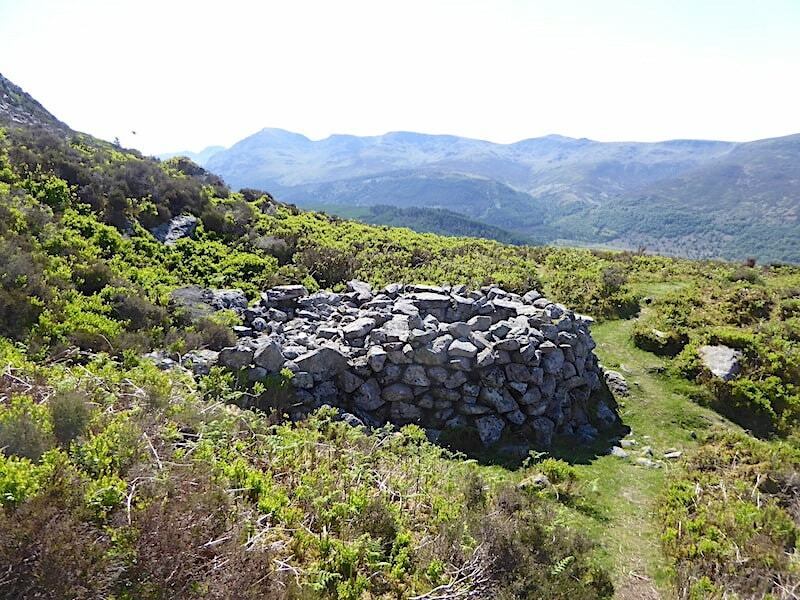 The tangle of old fence posts creates a skeletal looking cairn while the more traditional stone variety provides a resting place for a hot and hungry traveller. 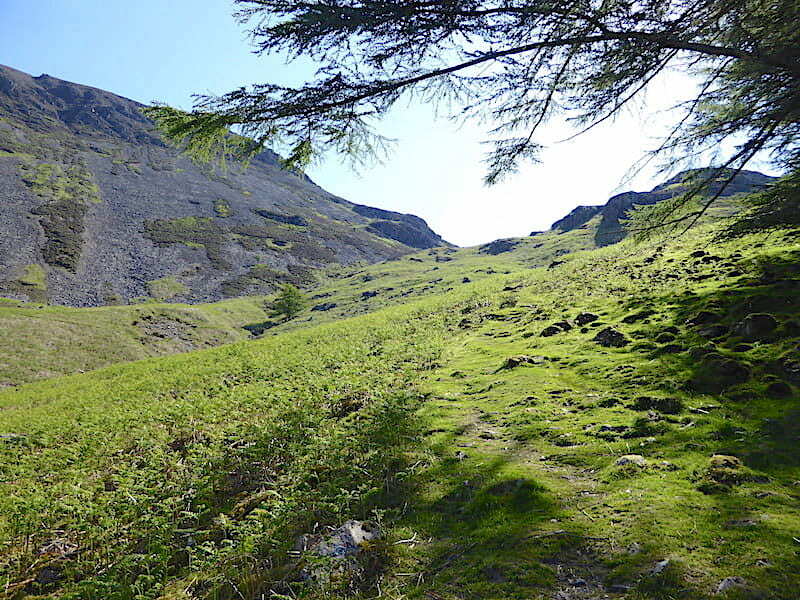 We retreat to a comfy little hollow, down packs, get out the sandwiches and indulge in a little fell spotting as we ate our lunch. 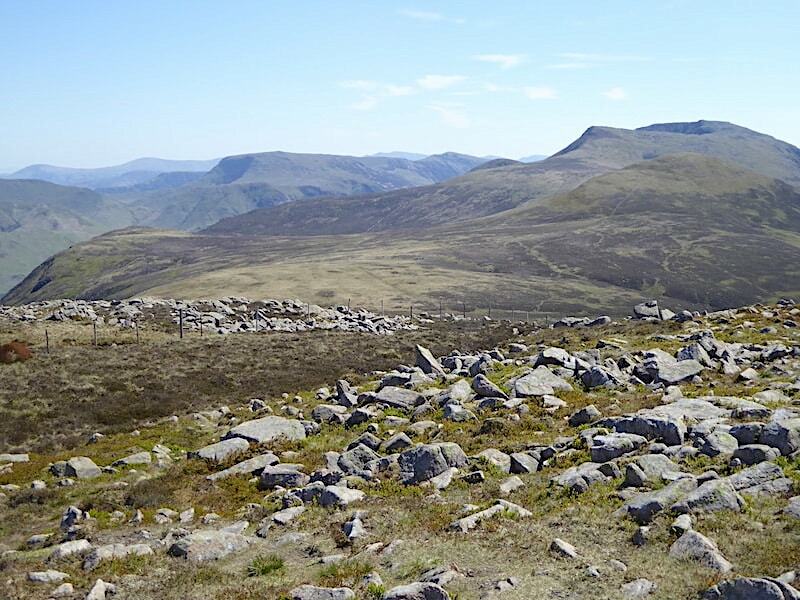 Taking centre stage across the middle foreground is the Knott Rigg – Ard Crags ridge. 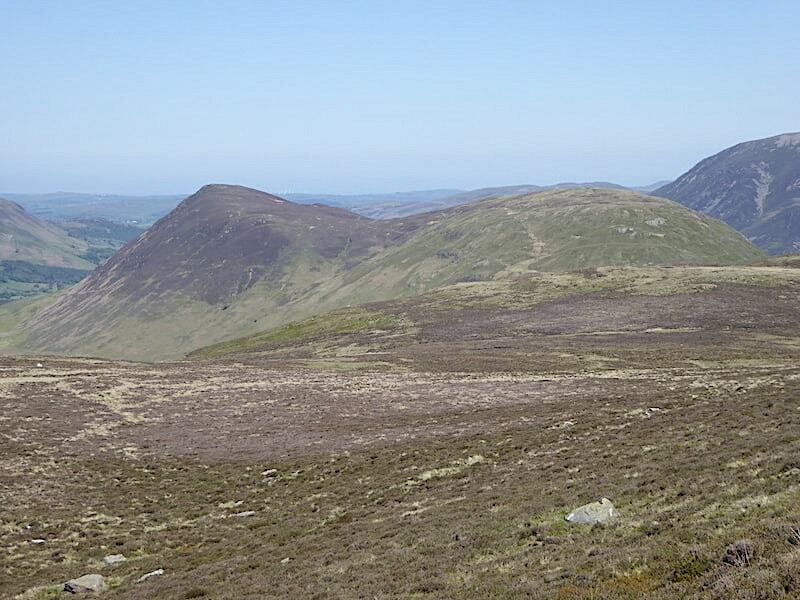 Causey Pike and Blencathra are behind the peak of Ard Crags over to the left and Clough Head is the prominent high fell on the right. The Red Pike-High Stile-High Crag ridge behind Starling Dodd’s summit cairns. 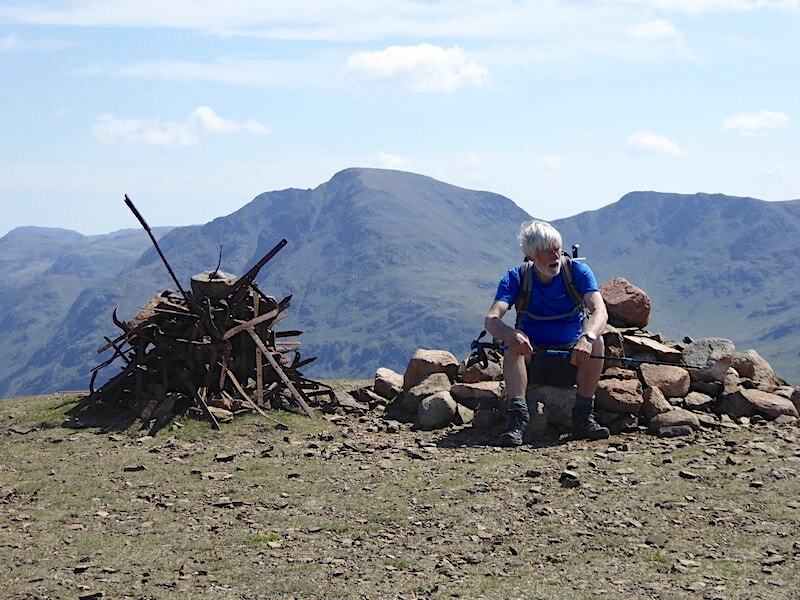 During our lunch stop we decided we’d carry on over to Little Dodd which is nothing more than a grassy mound, and looks very insignificant below the more glamorous peak of Red Pike. 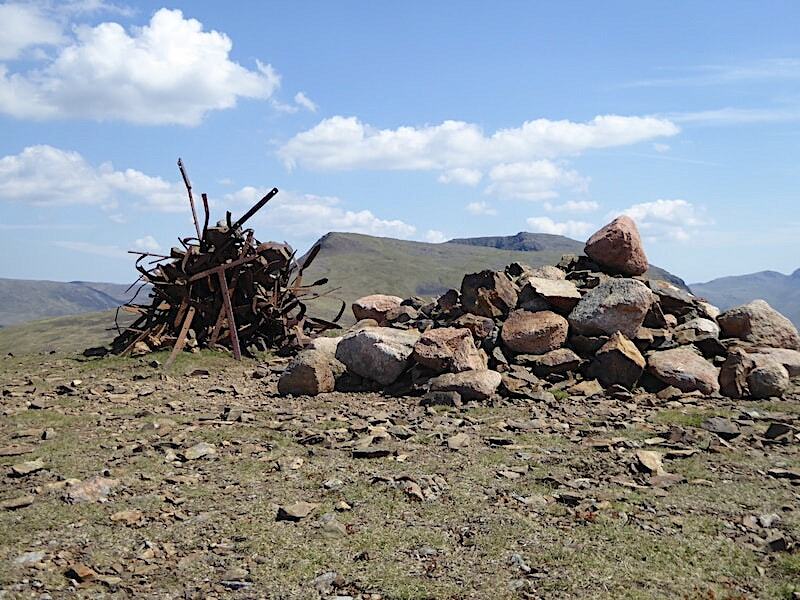 There’s nothing insignificant about Little Dodd’s artistically arranged cairn though which was quite a novelty since these smaller hills generally have only a couple of stones marking their summits or, more often than not, no stones at all leaving you in a kind of summit limbo. Here I’m looking back at Starling Dodd while J goes off to see if he can locate the path coming down from Red Pike which is clearly indicated on the OS map. He couldn’t see any trace of it. 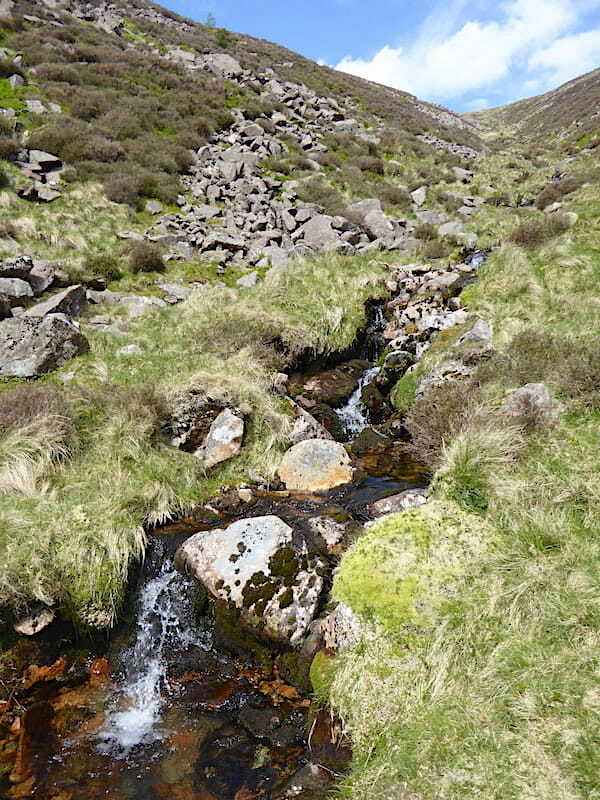 We leave Little Dodd and walk in the direction of Red Pike to locate the beck which rises between it and Little Dodd. 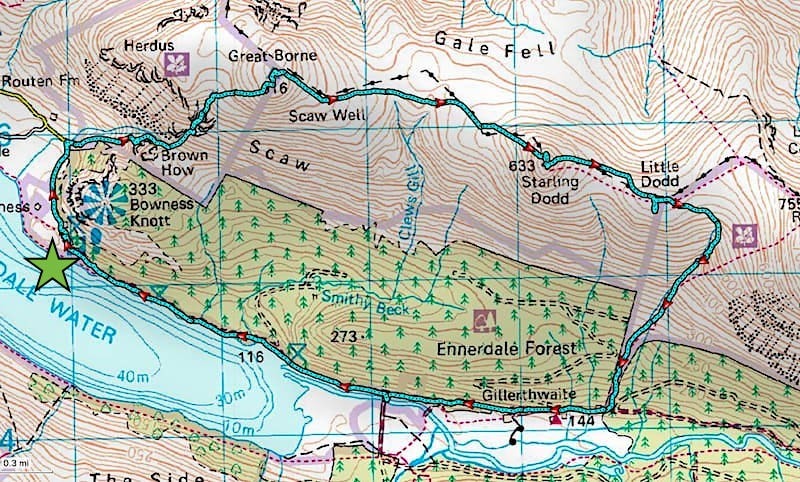 According to the map we should be able to pick up the Red Pike path once we are across the beck and on the slopes of Red Pike. 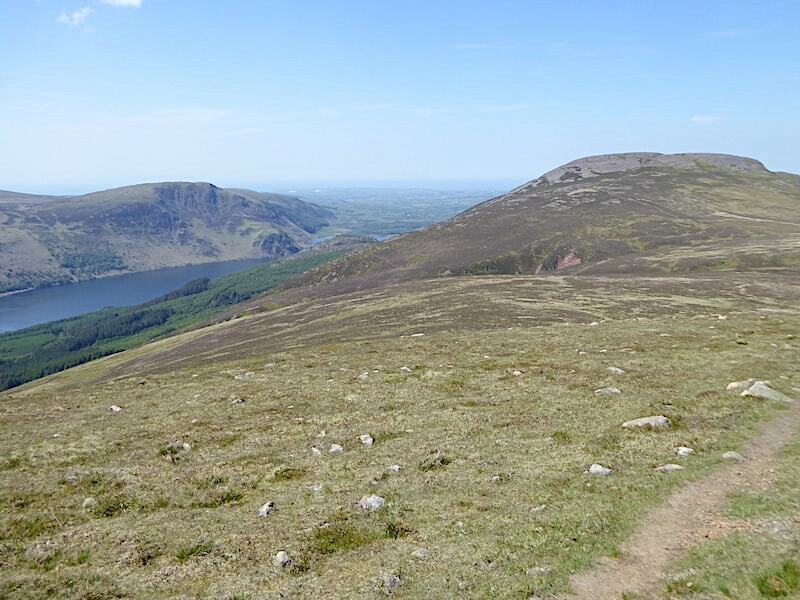 When we got over there we found no trace of a path coming down from Red Pike. 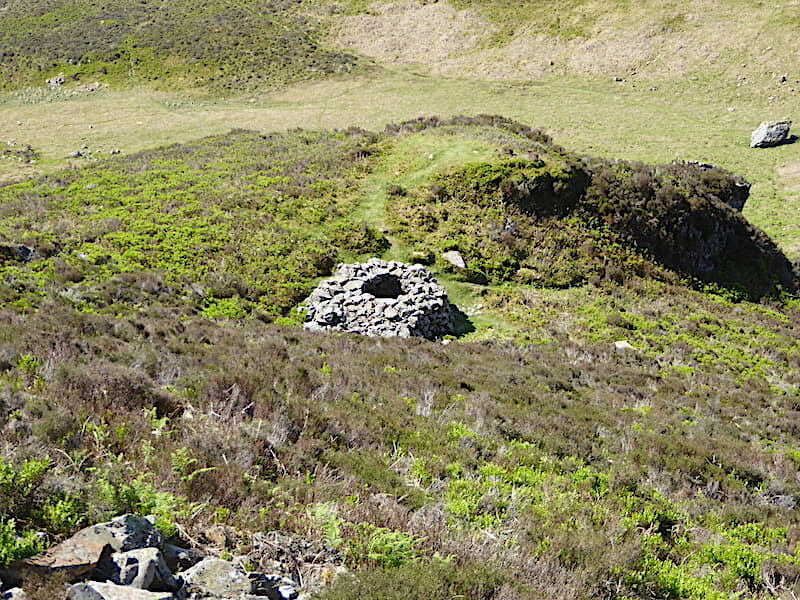 Maybe we didn’t go far enough across, perhaps it was hidden by the grass and stones, or it could have simply fallen out of use and become grown over. 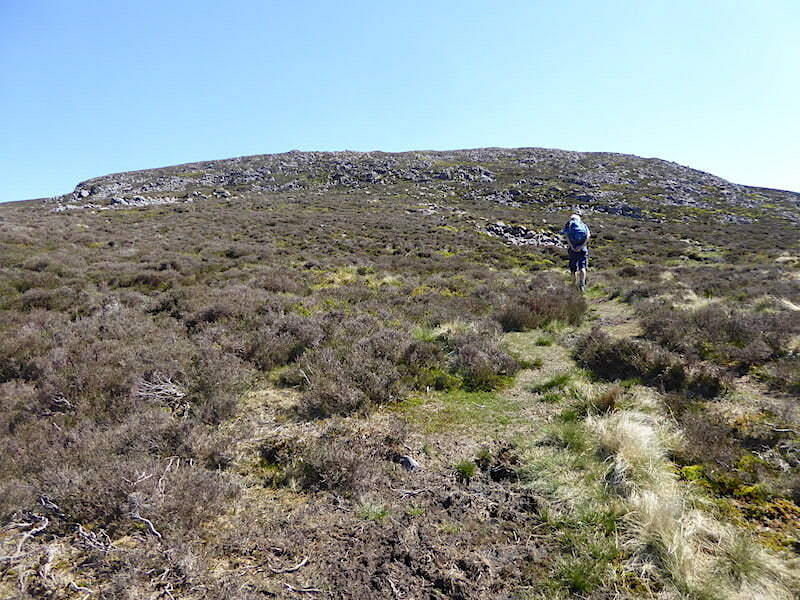 Whatever the reason we couldn’t find it and had no choice but to descend over some very rough and rocky ground, thick with heather and bilberry for a good part of the way down the fellside. As we descended further towards the beck we could see this grassy track running alongside it and headed down towards it. 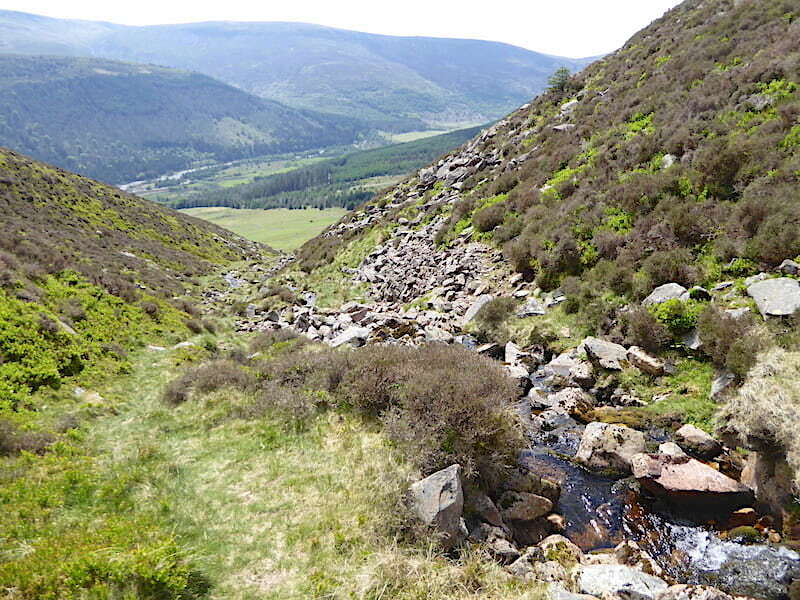 This view back up the beck indicates the type of terrain we had to cross from the higher slopes before reaching this much more comfortable path alongside the utterly charming little beck trickling down into Ennerdale Water via a series of mini cascades. 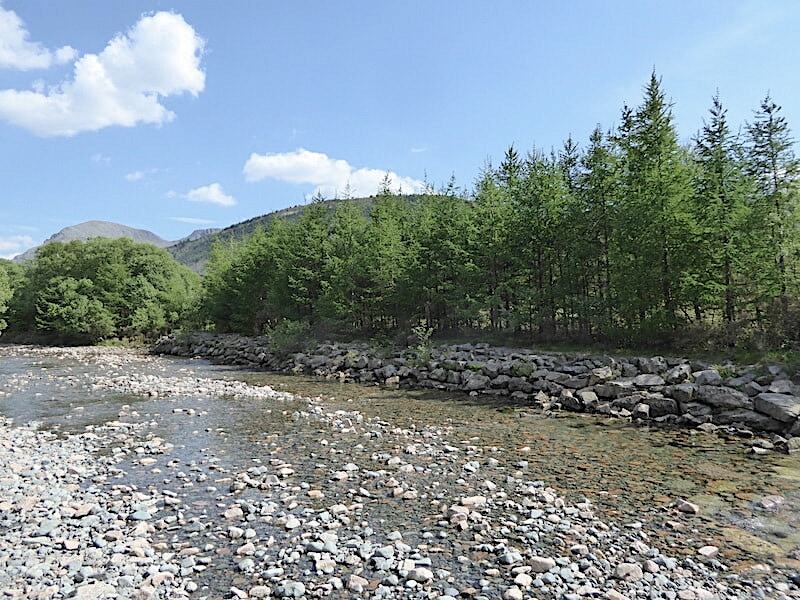 Although we still had plenty of liquids left in our packs we held a couple of empty bottles underneath the trickling falls, drank our fill of the clear, cold water and then re-filled the bottles giving us extra supplies in readiness for the long trek along Ennerdale back to the car park. Faces, necks and arms were splashed all over too and left to dry in the sun as we continued down the path. 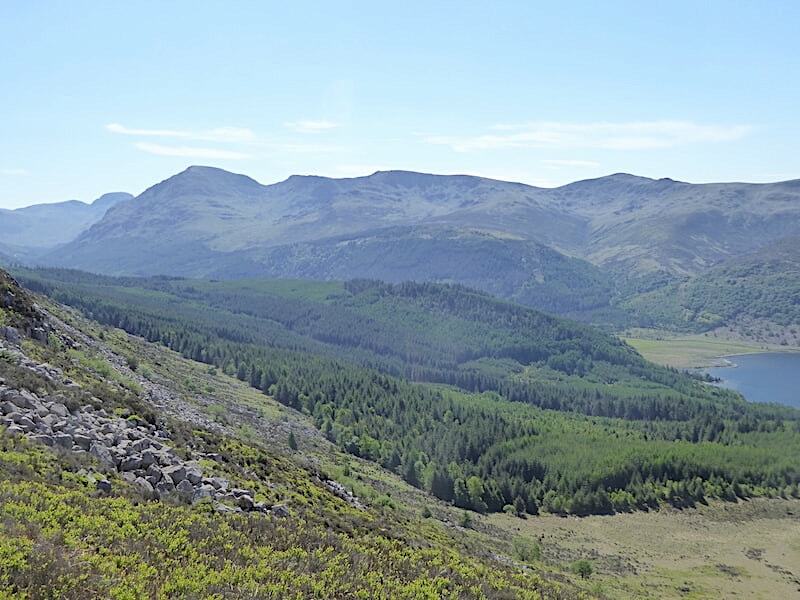 Across Ennerdale the sun lands on the fells across the valley, so I took a closer look at Pillar, on the left, then comes Wind Gap followed by Black Crag with Windgap Cove between the two. 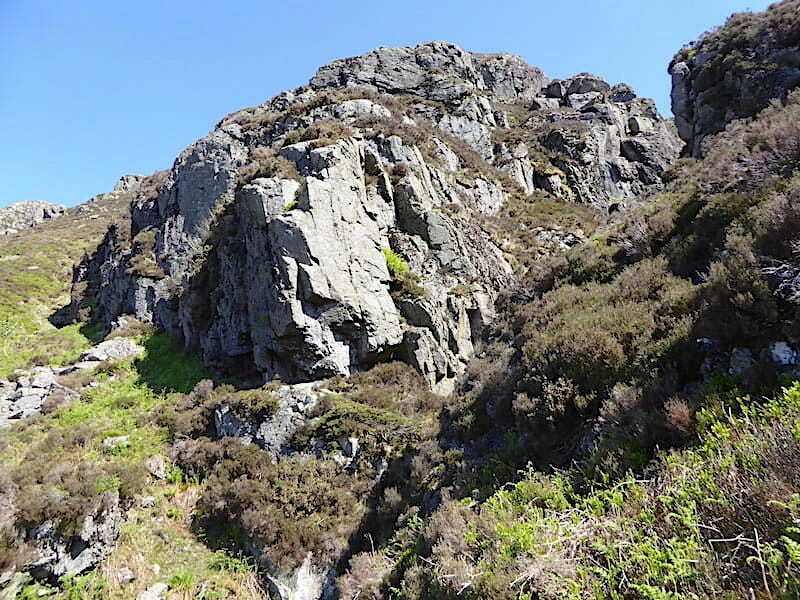 Continuing on from Black Crag we can see Little Scoat Fell just behind the peak of Steeple with Mirk Cove between them. 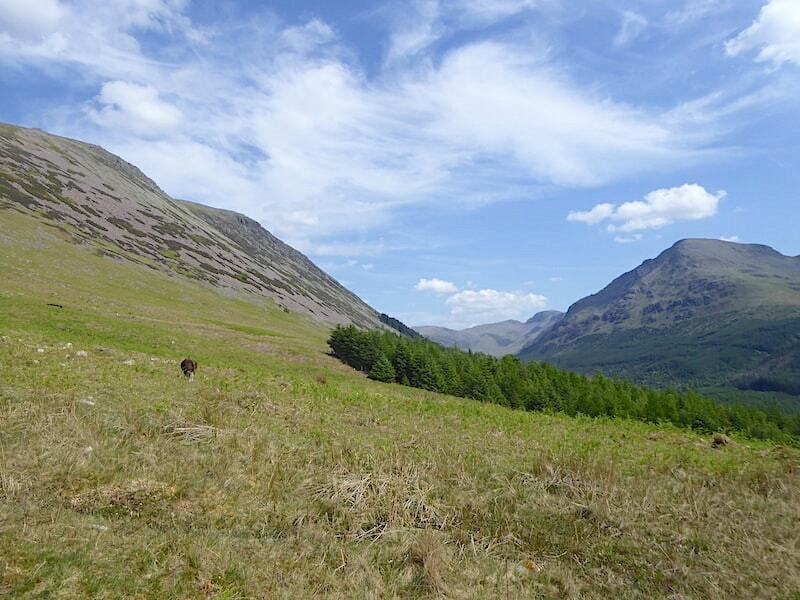 The grassy path eventually widens and swings away from the beck, leading us down, through acres of dense new bracken, to Ennerdale and the sparkling River Liza. 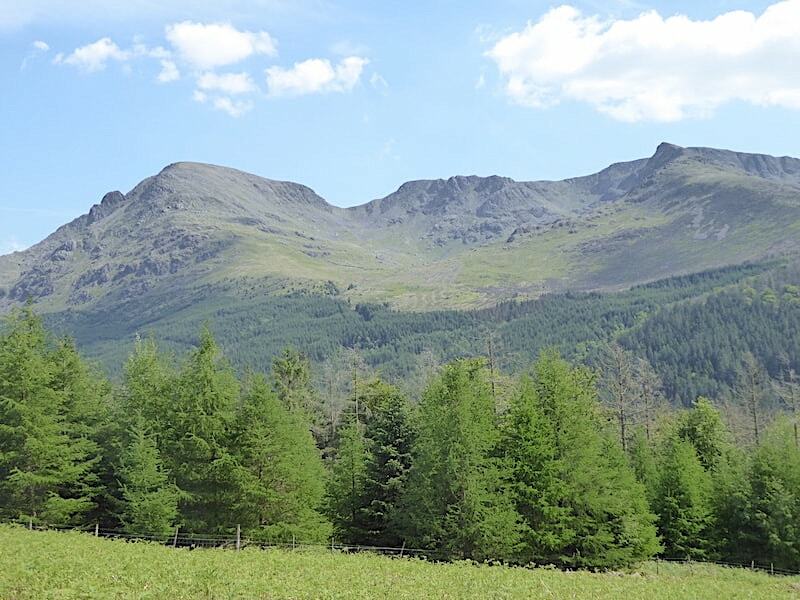 The view along Ennerdale and the tree plantations of Ennerdale Forest as we cross the lower slopes …..
….. and a look back up at the v-shape through which runs the little beck we’ve just walked down beside. 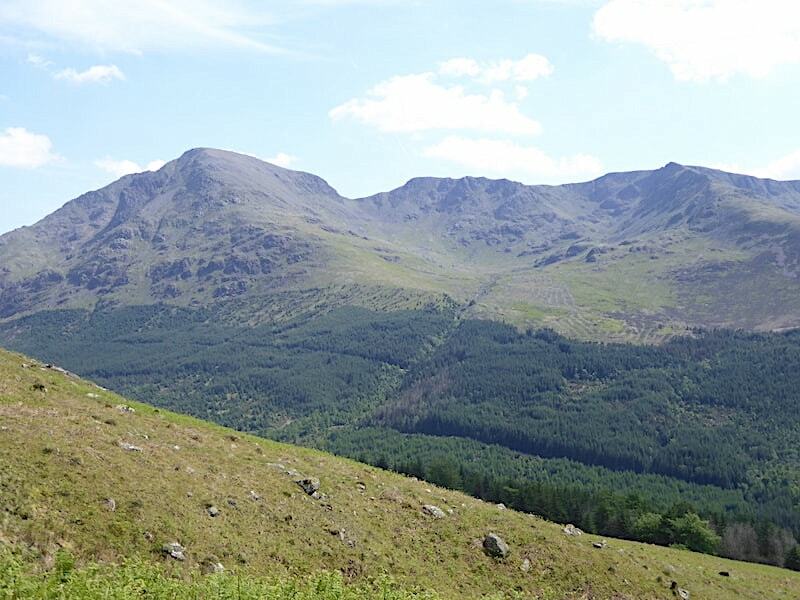 It isn’t named on our route map but on the OS map it is marked as Gillflinter Beck. 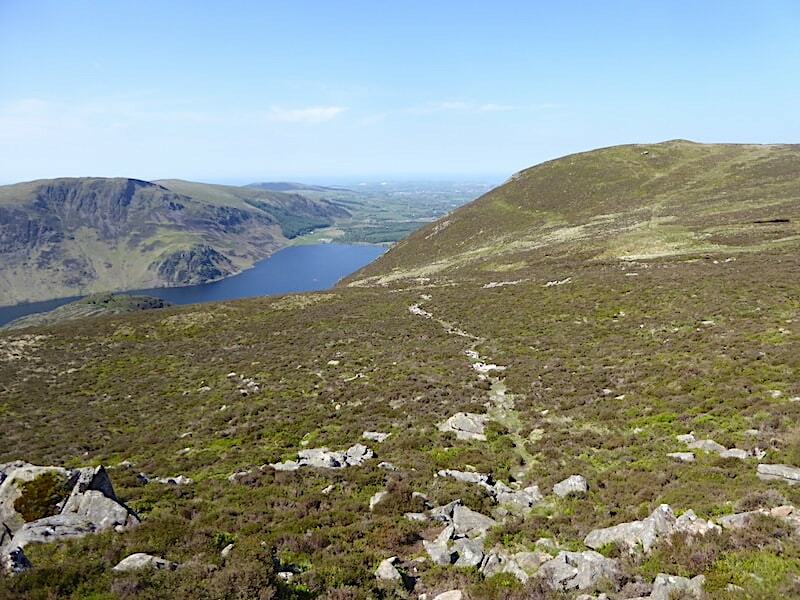 We scan the slopes of Red Pike but still can’t see any sign of the path coming down from it so where its exactly located and quite where it joins the beckside one remains something of a mystery. It was hard to resist taking another shot of this lovely skyline view, especially as Pillar Rock, on the left below the summit of Pillar, was now nicely silhouetted against the clear blue sky. 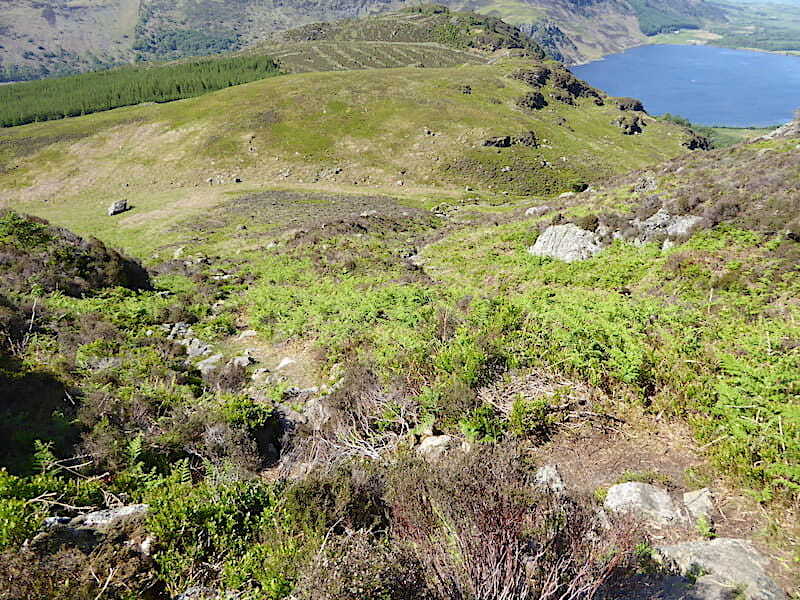 Below us is the gravelly road through Ennerdale so our descent is almost over. A convenient pile of stout wooden poles left beneath the trees just beside the road was too tempting to ignore so we had a short break there. Its a little over two and a half miles back to the car park so there’s plenty of walking still to do. 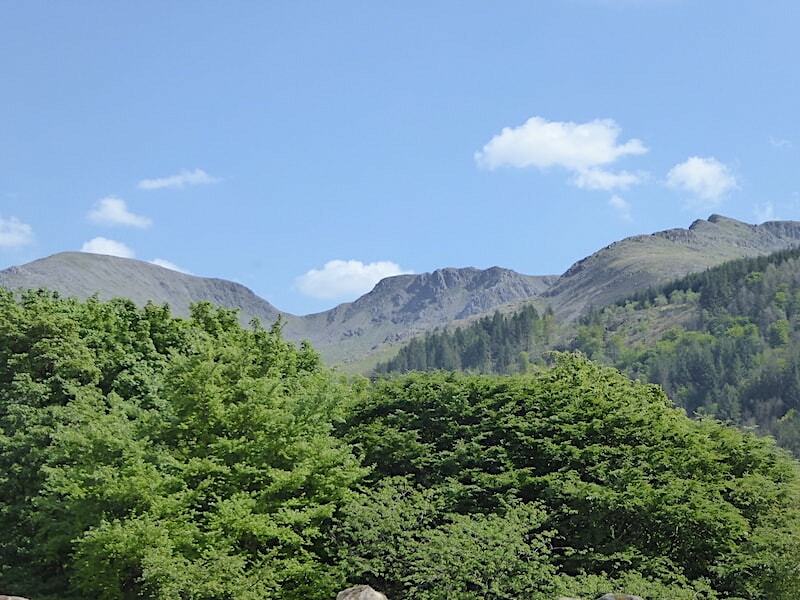 Along the track we pass the YHA building at High Gillerthwaite …..
….. and then we have our last view of the Ennerdale skyline which I took especially for the view of the series of rocky tops rising up to Steeple’s summit on the far right. All we could see of the Low Gillerthwaite Field Studies centre were its rooftops and there didn’t seem to be much activity going on either, not a sound was coming from it. Down at Irish Bridge across the river Liza and another re-fill of a water bottle or two. I considered indulging in some foot spa therapy but I resisted the temptation. Looking upstream along the sparkling River Liza from Irish Bridge and where only the very top of Pillar is still visible. We return to the hot and dusty track with a little over two miles to walk before we reach the car park. Only authorised vehicles are supposed to venture beyond the Bowness Knott car park and even with that restriction there was plenty of traffic trundling up and down, and raising clouds of dust behind them. 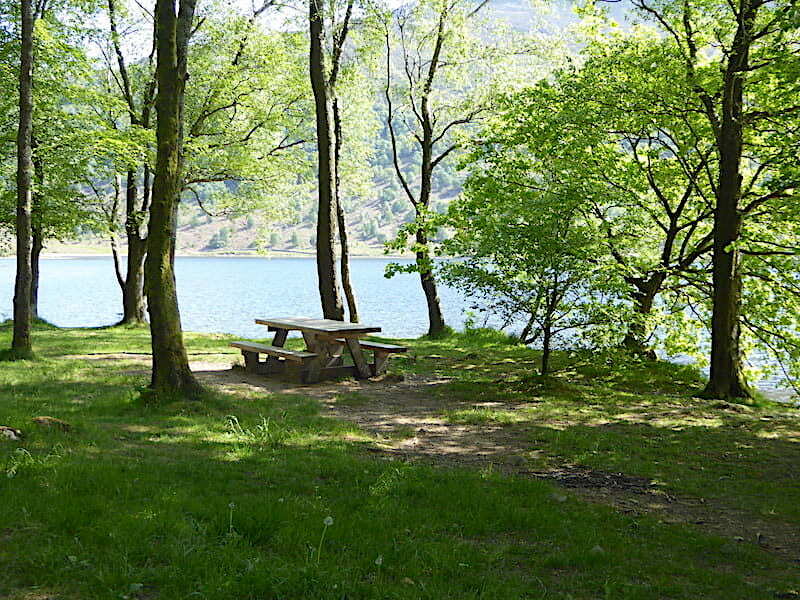 At intervals along the track picnic tables are tucked into shady little spots and very inviting they looked too. We didn’t stop, it can be very hard to get under way again once you do so we just keep to a steady rhythm, forget the dust and the stones under our feet, and just appreciate the views as they come along. Winter storm debris litters one of the little beaches which crop up here and there along the shoreline. 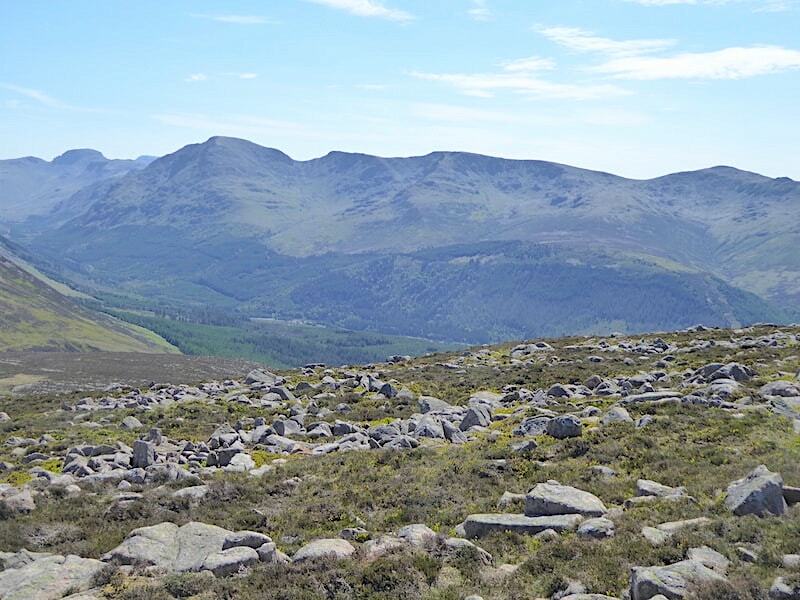 From another little bay there’s this view of Crag Fell with its pinnacles outlined against the sky. We begin to meet more people just out for a short stroll as we get nearer the car park, mostly parents with young toddlers and folks walking their dogs. 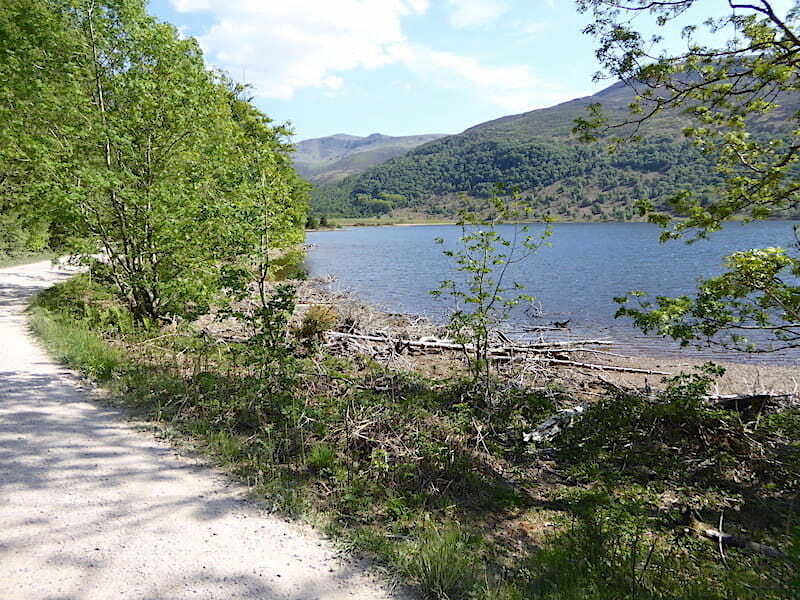 The very last part of the track from the lakeshore back up to the car park is a longish climb of about 100m but it does have a tarmac surface which takes some of the sting out of it. At the end of the last little climb we reach the car park which must rate as one of the most attractive parking areas in the Lakes, or anywhere else for that matter. 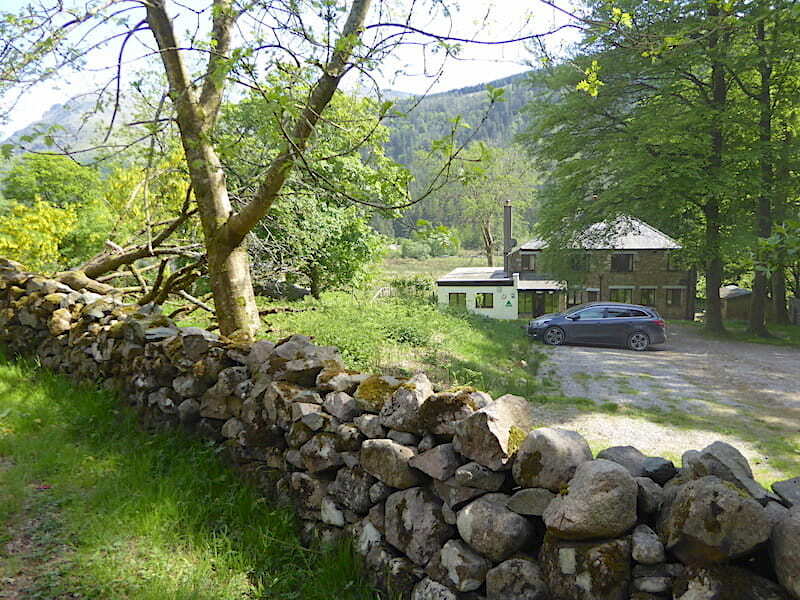 Informally laid out, surrounded by trees so there’s none of that blast of heat the minute you open the car doors, and to add to its appeal there are no parking charges. All the gear is stowed into the boot and we sink gratefully into our seats in the cool interior of the car. I can relax a little as I’m not doing the driving back, J gets his chance to relax while I’m rustling up our evening meal. I think there’s a strong possibility that his relaxation might even be accompanied by a can of beer, apparently water and fruit juice aren’t quite hitting the spot and, I am informed, it will round off the day very satisfactorily.